I hope that 2013 is a great year for all of you! I’m sure that it seems like it, but I haven’t really forgotten about this blog, and I do have some further plans for it in 2013. 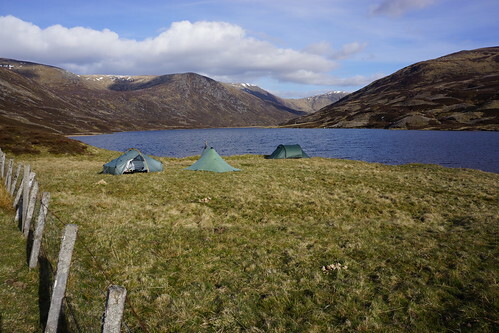 It’s likely that I will be doing another TGO Challenge crossing of Scotland in May. That’s not a certainty yet, but since I’m #8 on the standby list (as of last week), it seems pretty likely that it’s going to happen. This year is more favorable regarding the schedule than the last several have been, since the HL7 meeting that I typically attend and the Challenge are overlapping only on the first day this time – so I’m planning to go for it again if I have the chance. Assuming that the TGO does in fact happen again this year, then I’ll likely take a break for a year or two after that, and hopefully will see and experience some of the other wild parts of the US and/or the world. One of those that I’m still thinking of is Alaska – if not this year, then soon. So stay tuned…! Lisa and I and our two oldest granddaughters, Erin and Anna, flew from Louisville back to Salt Lake City today and are now home in Midvale. It seems both good and also a little weird. It feels in some ways like I’ve been gone for only a few days, and now pretty much everything seems completely back to normal, even though I was actually gone for basically a whole month – April 30 to May 30. I also in a number of ways don’t really want this trip to be over – but now it actually is. So it’s time to get back to normal activities. Lisa and I had our final rehearsal tonight prior to the West Valley Symphony concert coming up this Saturday. I was really out of practice on my trombone, but it actually went fairly well. I’m also back pretty heavily into work – that’s fine and it’s certainly needed, especially after being out most of May. There’s plenty to do around the house and in the yard. 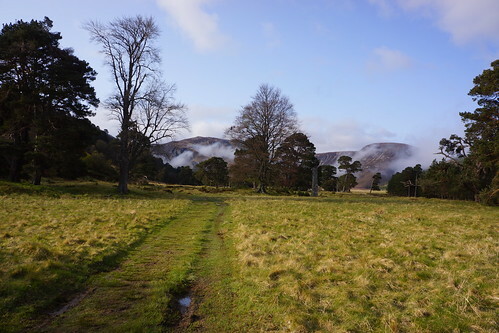 But there’s also some very good walking possibilities nearby – we’re blessed to have a lot of that around here, and it’s time to take advantage of more of it! Well, so much for posting more frequently. I guess I’m probably pretty much convinced by now that blogging regularly in more or less real time during the course of a walk like the Challenge isn’t very feasible – at least for me. But maybe I can find some better strategies for the next opportunity. It’s now Sunday afternoon in Louisville, Kentucky where I’m writing. 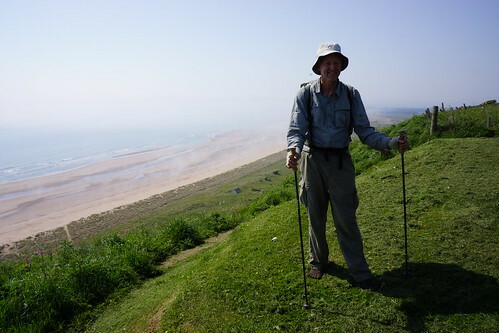 On Thursday just after noon I made it to St. Cyrus, walked down the cliff to the beach, and put my toes in the water – the official end of my journey! My original plan was to finish at Dunnottar Castle near Stonehaven (same as in 2007), but because I was still running just a bit behind schedule I thought it would be best to alter the plans slightly and walk from Tarfside to St. Cyrus (via North Water Bridge) to finish there, rather than try to make it to and through the Fetteresso Forest and still get to Montrose at a reasonable time on Thursday. 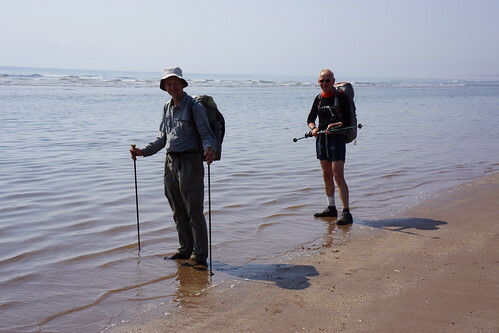 I walked the last leg from North Water Bridge to the finish at St. Cyrus with Freddy Campbell, who I had met initially at Newtonmore and had walked with earlier a couple of times. Freddy also had a pair of Vibram FiveFingers with him – he just hadn’t worn them all the way across as I did. It was nice, though, to find someone else to confirm that maybe my idea of wearing them wasn’t completely crazy (but you’ll have to confirm with Freddy to see if that’s what he really thinks ). 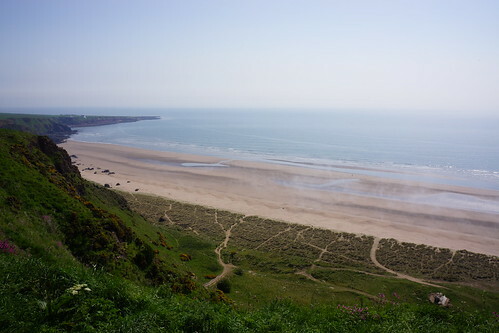 After my toes got wet in the North Sea and I climbed back up the cliff (a rather significant cliff, actually), several of us had a bit to eat at the cafe down the road in St. Cyrus and then caught the bus to Montrose. I signed out at Challenge Control in the Park Hotel and was handed my certificate, pin and T-shirt – making it all official. 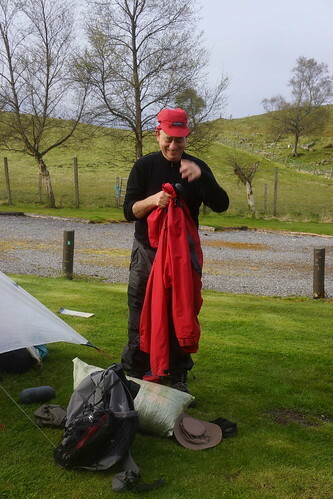 After setting up camp for the last time of the trip in the caravan park down the road in Montrose, I got cleaned up and changed into non-hiking clothes and got ready for the Thursday Challenge dinner. Prior to the dinner I met with Andy Howell and some other folks in the bar. The dinner itself was pretty decent (I thought), but mostly it was good to hear the speeches and comments and have the opportunity to chat with more folks. I did get the opportunity afterward to meet another US Challenger, Ron Moak (founder of Six Moon Designs), which I had been hoping to do. My first ultralight pack was a Six Moon Designs Starlite, which I used on my first Challenge in 2007. 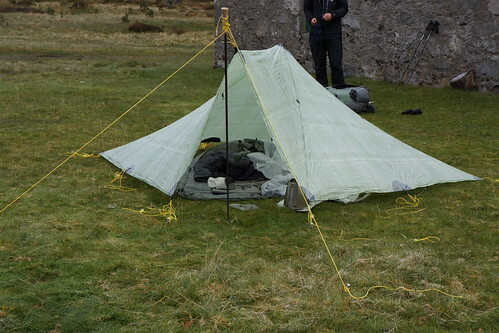 Lisa and I also used a SMD Lunar Duo tent on our 2009 Challenge attempt (we didn’t finish that year). Anyway, it was a pleasure to be able to meet Ron. It sounded like he had a pretty interesting crossing, as most of us did in one or more ways – hopefully we’ll be able to hear more about it. The evening was rounded out with a conversation that David Lintern and Tanya Morgan and I had with Chris Townsend – always a pleasure. 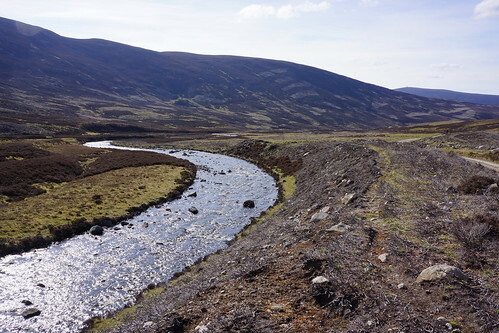 We covered quite a few topics, beginning mostly with David’s new work with the John Muir Trust and various environmental issues related to Scotland, particularly in the highlands. 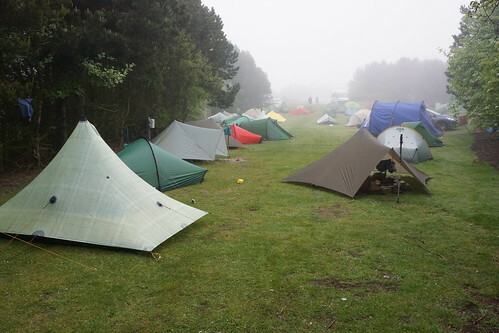 After that I popped into the hotel bar for a few minutes where quite a few other Challengers had been congregating, but it was actually closing up time by then, so I made my way back to the campsite to get some quite needed sleep. Additional notes (11 June): Just four days left to the end! – I’ll finish them up now. 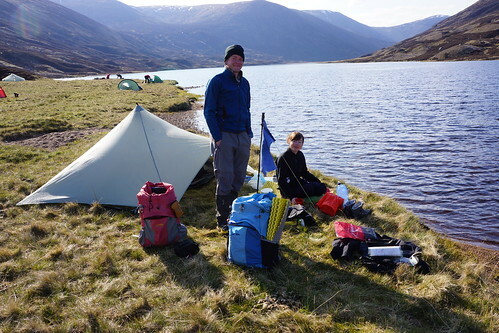 Monday morning at Loch Callater looked like it was going to be quite nice – and it was. 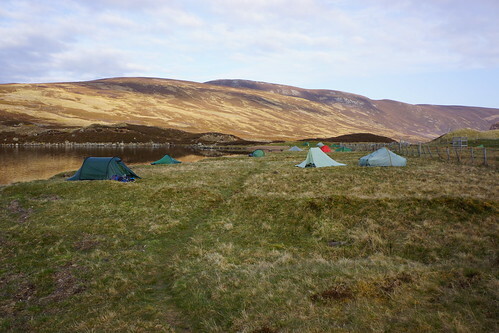 I got up and was packed up fairly early, and then wandered by some of the other tents as I was heading toward the lodge for a bit of breakfast – one of the again legendary “bacon butties”. 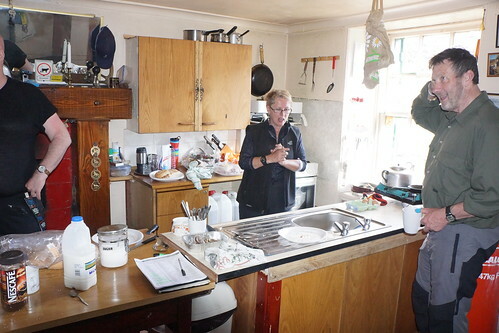 Jeannette Tennant added even more hospitality – preparing many bacon butties for a considerable group of hungry and very appreciative Challengers! A great way to begin the day. Bill Duncan - a wonderful host! 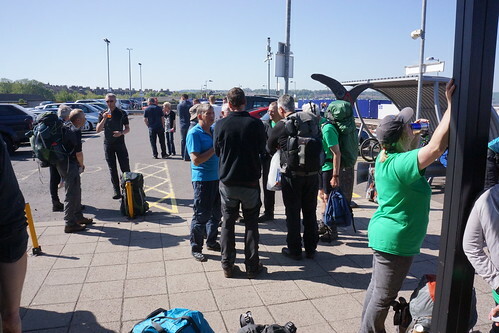 Other Challengers preparing to head out - after having had their bacon butties, of course! 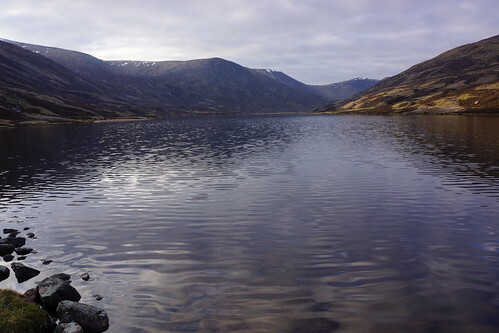 A beautiful morning leaving Loch Callater! 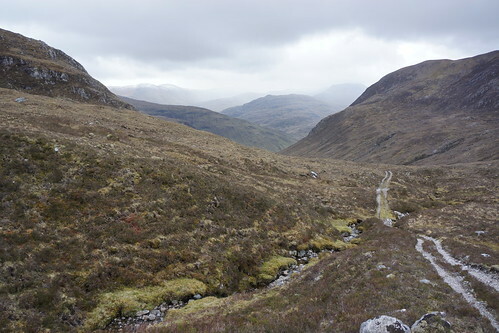 Jock’s Road turns out to be quite a climb – a very nice and fairly dramatic one, at that. 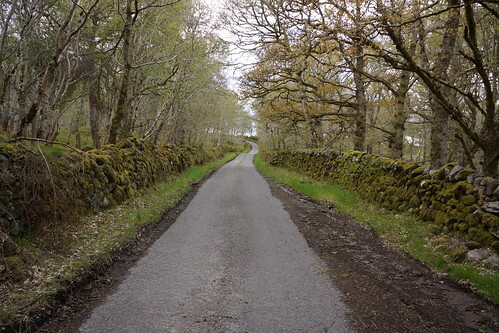 As far as being a “road” – I think that must be some Scotsman’s idea of a joke. 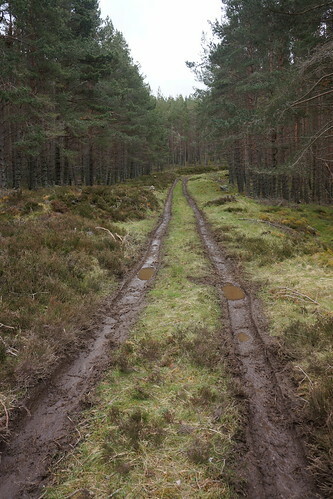 For parts of it there isn’t even a discernible path, much less a road (which is perfectly OK, actually). I met up with John Farrell (the Irish whistle player), Andy Dawkins and Chris (from Wales) about halfway up the Jock’s Road climb. Tim Nixon was also in the group with Andy and John, but at that point I didn’t manage to catch him in the photos. 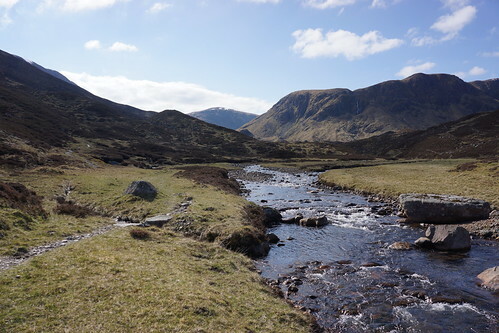 I ended up spending most of the remainder of the day walking with them – again, a very enjoyable time, and just a part of the TGO Challenge serendipity! 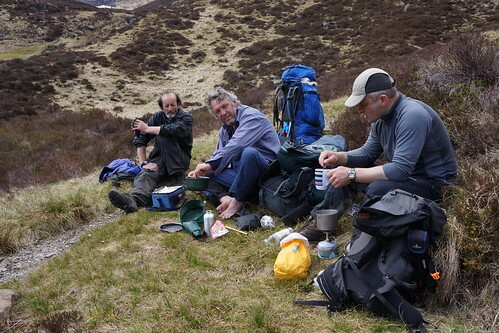 John, Andy and Chris - time for a break! 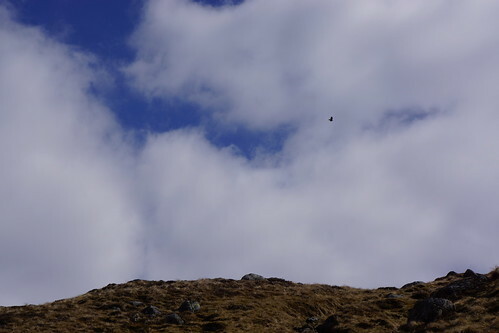 One of the highlights of that part of the walk was spotting and watching a golden eagle flying rather majestically and beautifully overhead. Golden eagle overhead - awesome! There were some beautiful views along the way. And more lovely views at the top. 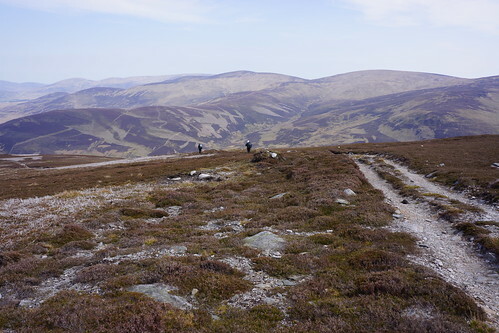 After a rest at the top, we then began heading on toward Glen Doll, and ultimately Glen Clova. That’s where Andy, John, Tim and Chris were heading, anyway. I was still about a half day or so behind schedule. 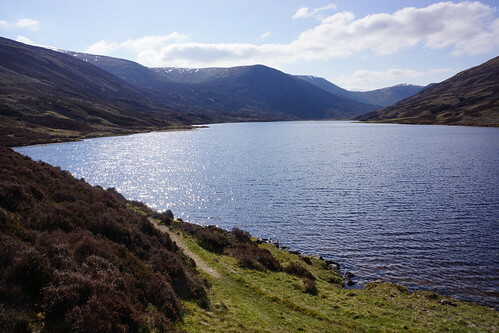 Theoretically I should have been getting to Tarfside today – but starting from Loch Callater rather than Glen Doll would surely make that far too long of a day. The blister on my right foot was still noticeable, which definitely didn’t help. 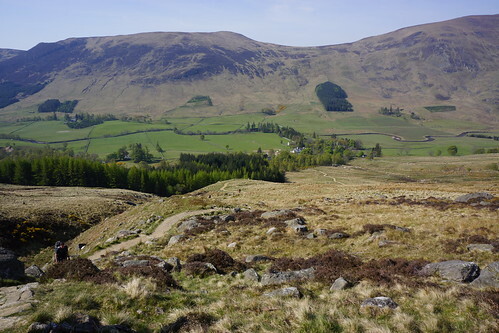 So at this point I just continued on with the rest of the group toward Glen Doll and Glen Clova, which was on my planned route, anyway. 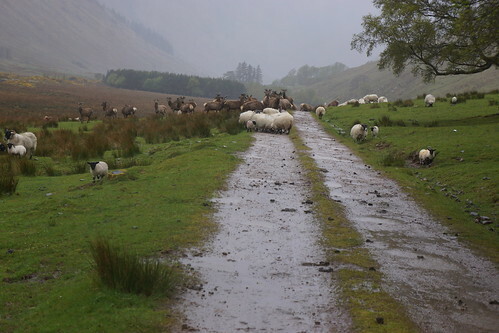 Once we emerged from the Glendoll Forest and into Glen Clova, we were back on the dreaded paved road again – definitely not much fun! I think everyone struggled with the road walk in one way or another – it definitely aggravated the discomfort from my blister. 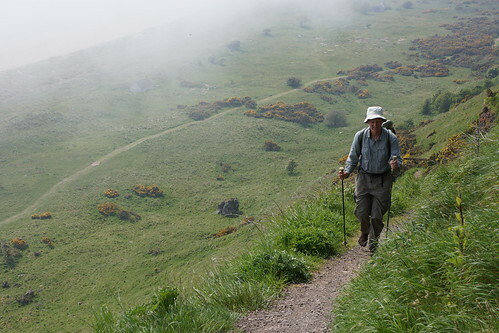 John had been having a bit of discomfort, as well, and took a bit of a slower pace. 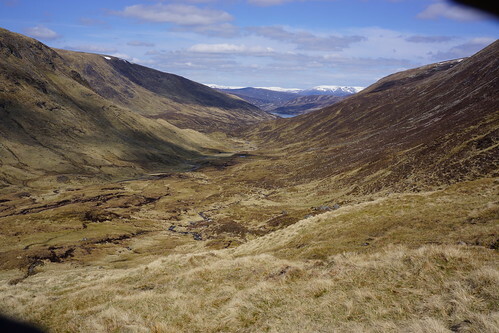 The goal now became getting to the Glen Clova Hotel. 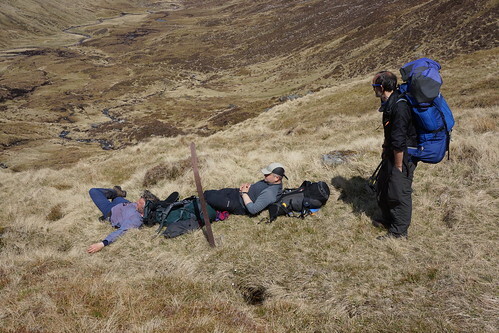 At that point there was a promise of a nice rest, beer, and food, if desired. That became my goal, as well. 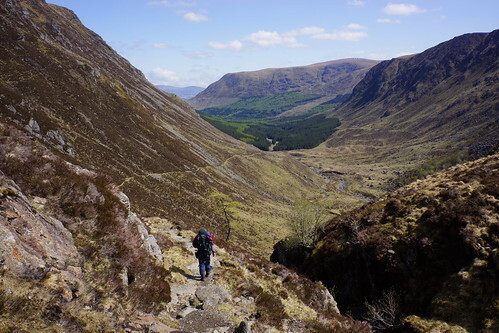 A good way back I had ceased entertaining any thoughts of going farther than Glen Clova. Tarfside would still be going in full force on Tuesday – that’s probably when the largest group would be there, anyway. 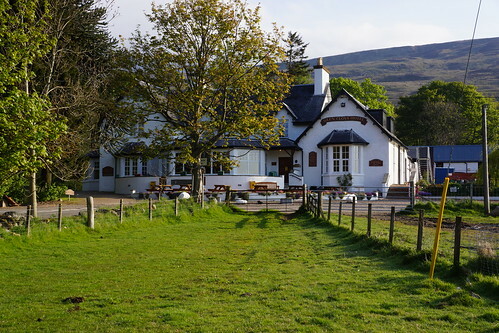 So, in the latter part of the afternoon all of our group arrived at the Glen Clova Hotel. We did have the beer, and Andy inquired with the hotel staff if we could camp nearby. 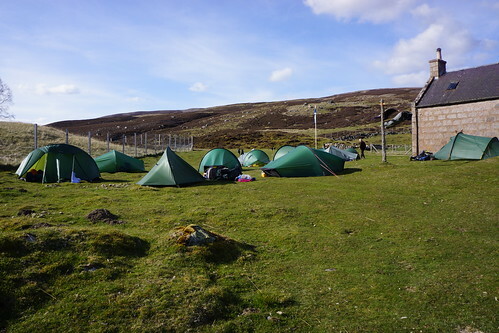 The staff were gracious and accommodating, and allowed us and a few other Challengers to camp in the open field just across the road from the hotel. That worked out well. 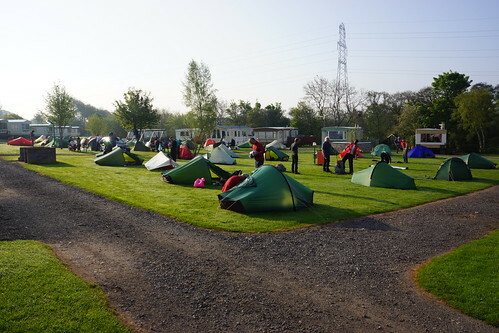 A number of additional Challengers, it turned out, were staying in the bunkhouse just in back of the hotel. A bit more conversation was had that evening, and then it was time for sleep. We woke up to another very nice sunny morning. Some of the Challengers were having breakfast in the hotel, and I decided to join up with Lee Wells and Tony Bowe and several others, not in too big a hurry. After breakfast it was time to head out. I was heading to Tarfside – Andy, John, Tim (and Chris, I think) had headed off in a different direction – ultimateley to Arbroath. 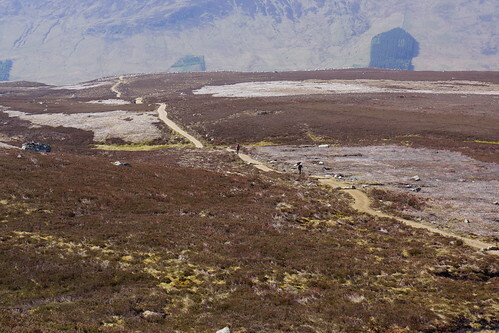 Probably the largest group were going the same way as I was, toward Tarfside. 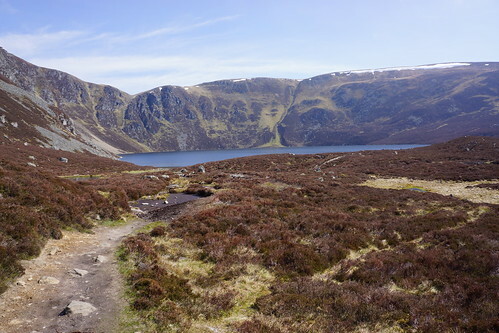 The first step was the climb to Loch Brandy. 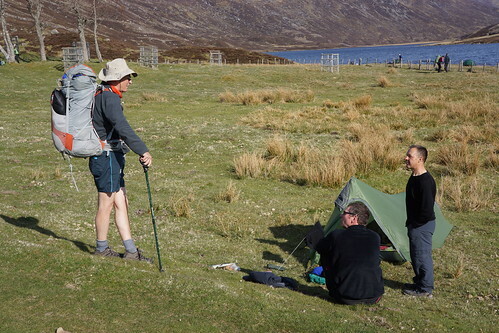 I joined up with Lee and Tony, and also Bernie Roberts, on the way from Loch Brandy. 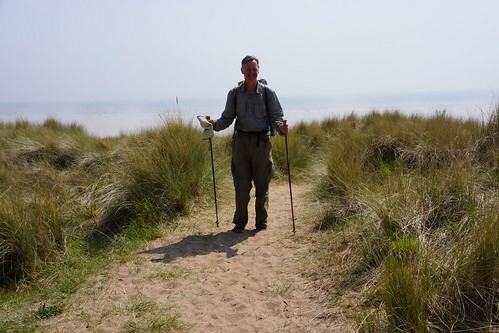 Bernie is one of the true Challenge veterans – this was his 19th crossing! 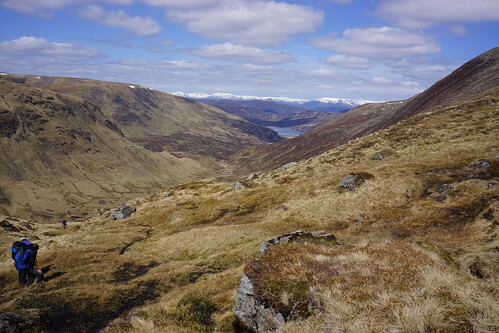 Rather than take the most typical path on the track from Muckle Cairn down to Loch Lee, our group had decided to go with a different route which would bring up into Glen Effock, and then on into Tarfside. The track on the top wasn’t very distinct, and at points wasn’t there at all. 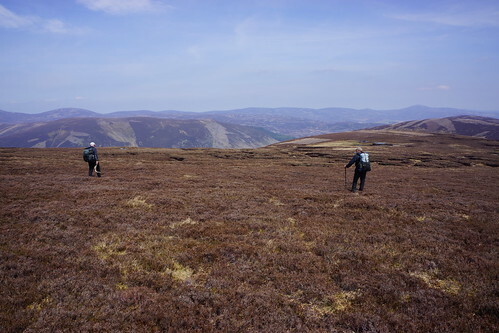 In the course of navigating toward Glen Effock we did a bit of back and forth in trying to get to the correct track. I mostly walked with Lee and Tony. At one point Bernie wasn’t quite satisfied we were where he thought we should be, so he went in a bit different direction. This is a good reminder regarding group navigation – there are some pitfalls to avoid. I think it’s a bit too easy to go along with the group and not pay close enough attention yourself. I’ve done that on more than one occasion. Generally you trust that the others in the group know what they are doing, and in a group like this they almost always do (as they did in this case). But I still think it’s easier to make mistakes than it would be if you were giving the navigation your full attention – it’s something to keep in mind. This wasn’t a big deal in any way, but, as I said, we did end up needing to do a bit of backtracking. 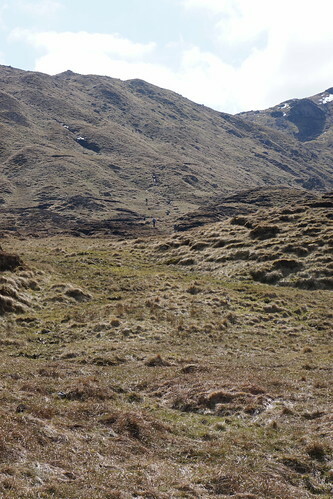 Bernie made it to the correct track first, as I recall, and then we all joined up again and began following the track in the right direction down into Glen Effock and toward Tarfside. Lee and Tony struck out and went on ahead – I believe the promise of the food and drink waiting at Tarfside was probably just too alluring. I was at first a bit ahead of Bernie, but then he passed by me, as well. I was going slower for a couple of reasons. This was a long, rocky descent, and I just didn’t want to take a chance on beating up on my feet too much with all of the banging down hard on the rocks. 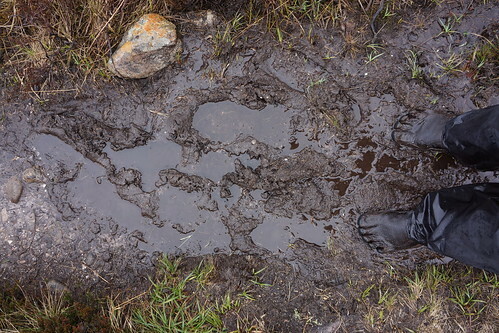 That is somewhat of a limitation of wearing the Vibram FiveFingers – I found that on long, steep descents of many of the man-made and very rocky tracks I simply needed to go a bit slower. I don’t think that’s necessarily a bad tradeoff, overall, but it is a limitation and it’s something to keep in mind. 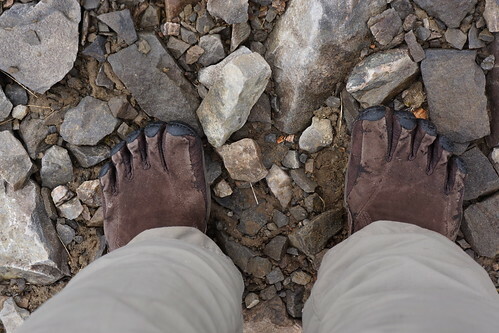 I’ve been wondering if a FiveFingers model with just a slightly thicker, but still very flexible, sole wouldn’t be exactly what is needed to make the FiveFingers an even better choice for trips like this on probably any terrain. I’m hoping to be able to discuss that with the Vibram company at some point in the near future. I think it would be great to be able to come back next year wearing a prototype of a FiveFingers “expedition” model! Another factor that slowed me down at this point was that May 22nd wasn’t just another day, at least for me – this was actually my 36th wedding anniversary! I wanted to try to call Lisa as soon as I was able – but I needed to wait until it was a reasonable hour in Utah (so at least mid-afternoon in Scotland), as well as when I had a mobile signal available (or some other communication option). 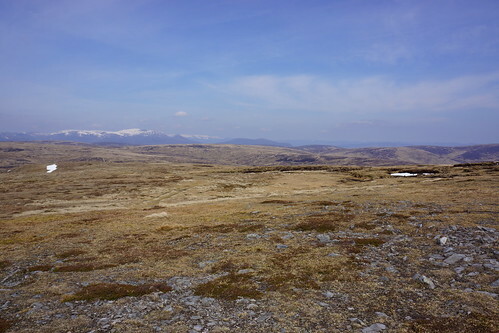 So, while I was still relatively high up on the hills, I wanted to see if I would be able to get a mobile signal – unfortunately, even though I tried at several locations, it just didn’t work. Occasionally I could detect a weak signal, but I was never able to make a connection. I finally gave up on that effort for the time being, and decided that I was going to have to try something else, most likely it would have to wait until Tarfside, and hopefully something would be available there. I kept on going down the track. 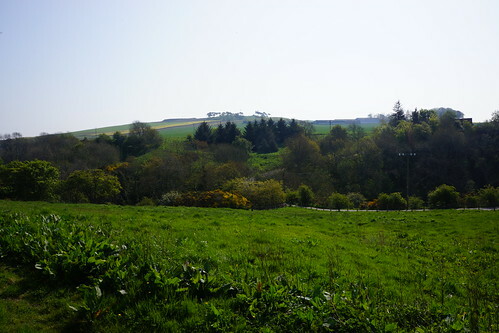 Soon the prominent monument on the Hill of Rowan was in view, which meant that Tarfside was not far away. 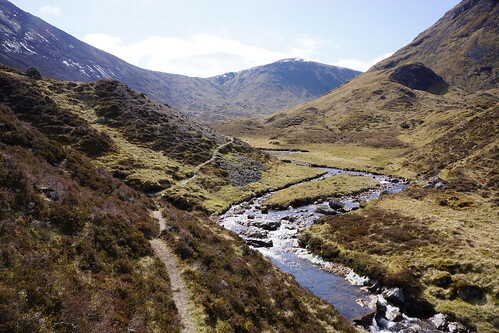 Once I got off the track and through the remaining bit of Glen Effock, what was left was another road walk for the rest of the way through Glen Esk to Tarfside – what fun – not! It didn’t take too long to travel the remaining distance, though, and I did arrive in Tarfside at a reasonable time. 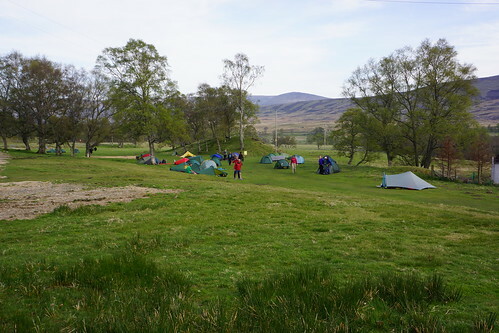 In fact, my timing seemed actually quite good, as the ladies from The Retreat Museum in Glen Esk had just arrived at the sports field (the designated camping area) and were beginning to take food orders! The Retreat Museum ladies - taking food orders! A number of Challengers were taking advantage of this service, and I did, as well. I had a realization shortly thereafter, though, that I also wanted to see what was being served at St. Drostan’s. 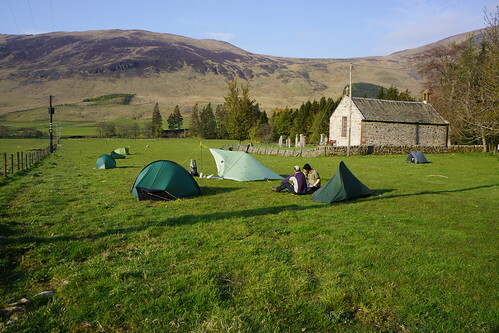 While I waited for the food order from The Retreat to be delivered I set up my TrailStar on the sports field and then walked over to St. Drostan’s to see what was happening there. A bit later, back at the sports field, I ate the meal that I had ordered from The Retreat. After that, I then went back to St. Drostan’s and also had some soup and bread. It was a bit more than I needed, really, but all of it was good, and it all worked out. I spent more time talking with folks at St. Drostan’s. I got quizzed a bit about my FiveFingers, and how they had been working out – some reactions seemed to be amazed/impressed/skeptical, or a combination of those, or maybe they just thought that I was completely crazy but were mostly too polite to actually say that. But actually there were some good questions, which I was happy to answer, and some at least tentatively positive responses. I talked with John Donahoe for a while about various things, including his interests and work with the John Muir Trust on various environmental issues. I asked if he had met David Lintern, but up so far they hadn’t met up yet. 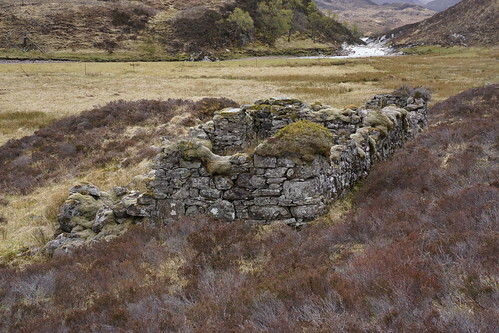 John really has a wealth of knowledge on apparently most things relating to Scotland – past and present. After a bit of further conversation, John invited me to come along with him to the pub at the Mason’s, which I had already been planning to do. I hadn’t been to the Mason’s pub before, as I don’t believe it was operating in 2007 when I had passed through here before – or even if it was in operation that year I hadn’t actually heard about it, and probably would have preferred to rest my sore feet, anyway. But since 2007 I had heard quite a bit about this gathering from various Challenge accounts, so this time I was more than happy to go along. It’s one more of the social gatherings that have become a tradition on the Challenge. This is actually a once a year event, where the pub is opened and operated specifically for the Challenge folks who are passing through on these two (or three?) days in May. I hear that it actually provides quite a bit of revenue for the town’s yearly budget, so it’s definitely a win-win situation. There pub was quite crowded, and there was a lot of conversation. Among others, I again spent some time with David and Tanya, but didn’t yet get the chance to introduce David to John. One more item still needed to be taken care of before the day was over. It was after 2300, and I still needed to call Lisa for our anniversary (of course it was only just after 1600 in Utah). 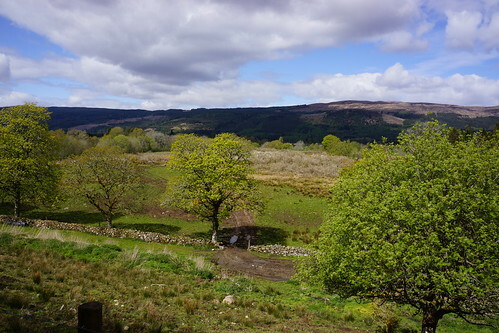 When I got to town I had checked, and there was, in fact, no available mobile phone service (which is the way I had remembered it – so apparently no change). I also wasn’t able to detect any Wifi networks – not a big surprise, but it could have worked, if there had been one that was accessible. So it looked like the only available option was the phone booth, which conveniently was just across the road from the Mason’s and adjacent to the sports field. I gathered up some coins, as this wasn’t going to be anywhere near the cheapest call that I would make to the US. After figuring out how to actually make an international call from the booth, I dialed Lisa and we were able to connect and have a brief, but good, conversation. Even though this wasn’t the way I would have preferred to make the call, it was definitely worth it! Also certainly it wasn’t the ideal way for us to be spending our anniversary, several thousand miles apart. 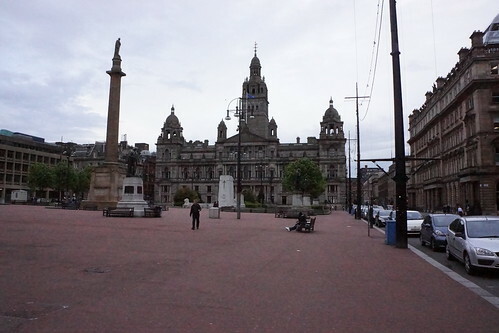 At one point I had hoped that maybe Lisa could join me in Scotland, and we could have an anniversary celebration and then she could also join me for the last bits of the trip, including the gathering at Montrose. That hadn’t worked out. But even though we weren’t actually together, I think that having the opportunity to talk still made it a happy anniversary! After the call with Lisa, it was time to end the day and get some sleep. It was cool first thing in the morning, but Wednesday promised to be another beautiful day in Scotland! I packed up and headed back over to St. Drostan’s for a bacon buttie – needed that energy! 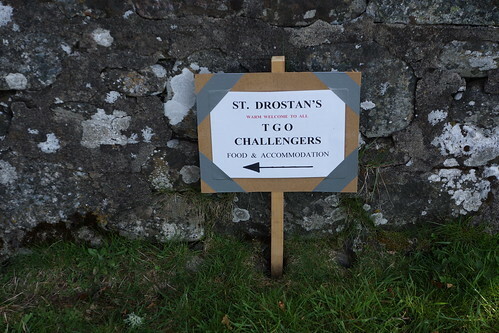 I decided to stop to take a photo of the sign welcoming the Challenger’s to St. Drostans’s – more TGO Challenge hospitality! A very welcome sign for tired and hungry Challengers! Some of the wonderful and incredibly helpful St. Drostan's crew! One thing I had to do today was make a final route decision. 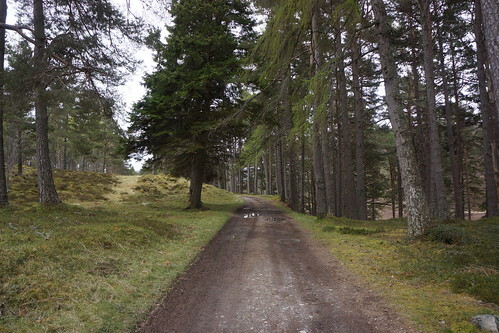 My planned finish was Dunnottar Castle, near Stonehaven, via the Fetteresso Forest – the same route that I took in 2007. 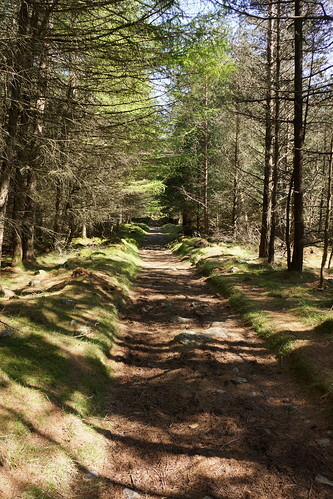 The big advantage of that route is that the exit from the Fetteresso Forest is the closest that you can get to the east coast with the least amount of “civilization” that you need to cross. I really did want to do that route again. The problem was, the way I had it planned and the way I had done it before, the likely spot to get to from Tarfside was Spittal Cott, just outside the Feterresso Forest, with still a fairly long day to go through the forest the next day to finally get to Dunnottar Castle. But, since this was already Wednesday morning, I really needed a rather short day on Thursday. I had to finish on Thursday, as I needed to make it to Edinburgh on Friday and fly out very early on Saturday morning. 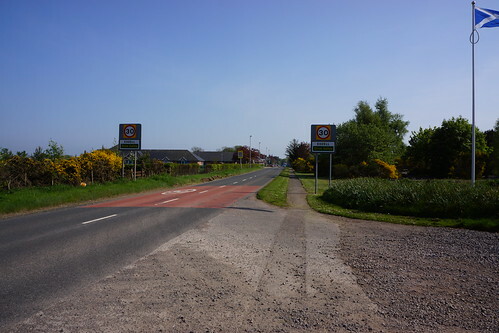 And for that to work, I had to be able to get to Montrose at a reasonable time on Thursday. Camping somewhere inside the Fetteresso might help, but my thinking was that it wouldn’t likely help enough to make it really work out all that well. So, the best course appeared to be to actually change my plans and finish at a different location. 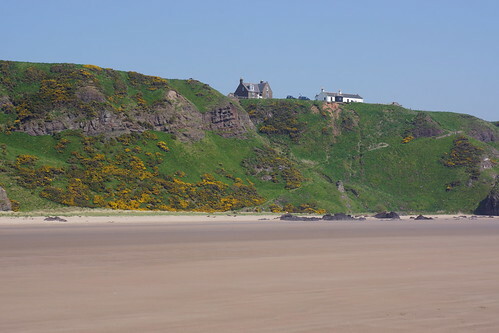 The most likely candidate for that would be St. Cyrus. 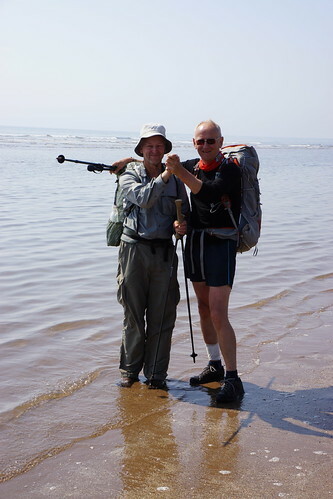 In fact, that was what Lisa and I had planned to do in 2009, if we had made it to the end of the walk. So, in that sense, I actually had already planned this (sort of). Plus, I was OK with the idea of doing something different this time around. 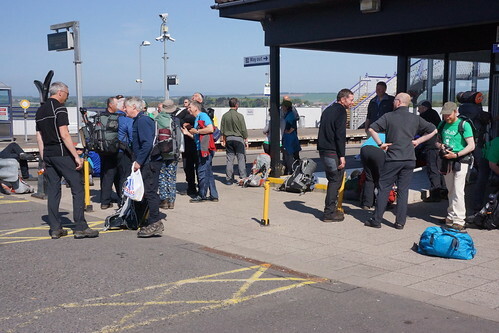 With all that, before I was ready to leave St. Drostan’s (actually probably the night before), I had made the decision to head from Tarfside to North Water Bridge via Ezell on Wednesday, and then on to St. Cyrus on Thursday. 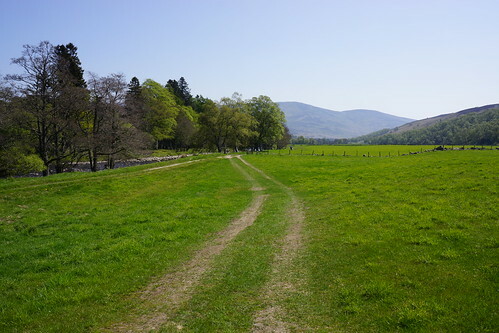 As I was leaving St. Drostan’s, thinking of beginning the road walk to Edzell, Bryan Waddington approached, heading the opposite direction from the sports field. The encounter with Bryan turned out to be quite serendipitous, as it gave me a chance to walk with him for a while, plus he steered me in a better direction. 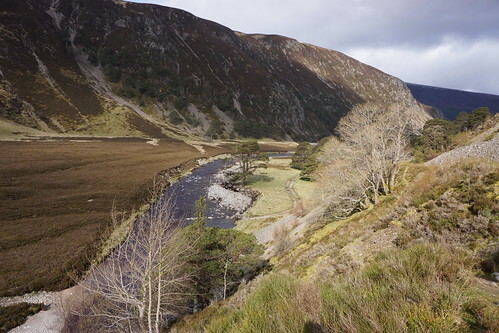 Rather than walking on the road, he had planned to take the “less traveled” route, crossing first to the south side of the River North Esk and then following a series of lesser paths and tracks to Edzell. It’s actually what I would have wanted to do, if I had spent enough time to actually plan it well. But since this was an unplanned change in route for me, I really hadn’t spent much time at all on working it out, and I was preparing to simply do it the “default” way. 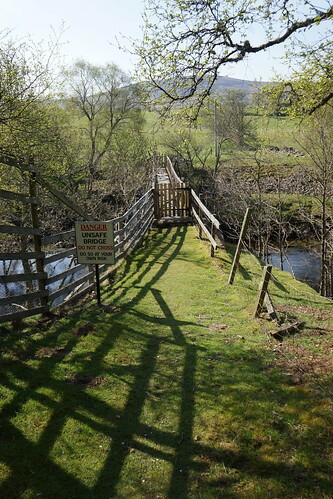 The first step along the “less traveled” way was to cross the “unsafe” bridge. But it really wasn’t all that “unsafe” – at least we both made it across just fine, single file. Bryan and I walked together for a while, then he went ahead as he was moving a little faster. 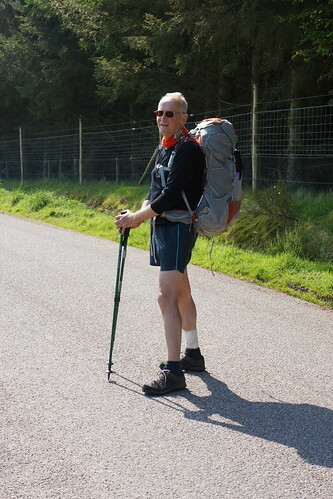 We still bumped into each other a couple more times along the way to Edzell. I also ran into several other folks at various times along the way. 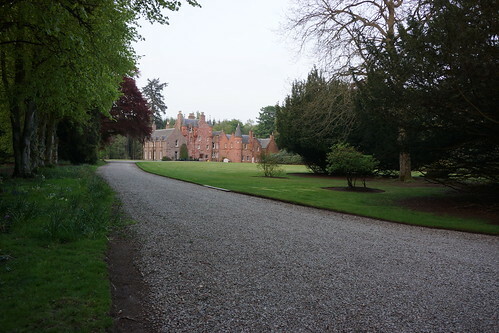 At Edzell I stopped to get some rest and refreshment, along with a number of other Challengers doing the same thing. I also met up with other folks, including, again, David and Tanya. 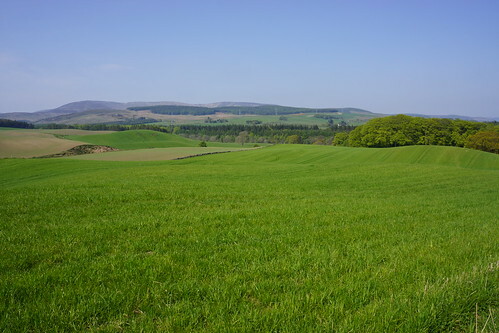 They had taken a different route over the Wirren hills to arrive at Edzell. On the whole, I have to say “very well done” on their route selection – they seemed to take pretty much any opportunity to make interesting and challenging, but still quite reasonable, choices. And those were most often “less traveled” choices. My hat is off to them for that, and hopefully they may serve as a bit of inspiration for me for the next time around (which assumes, of course, that there will be a next time!). 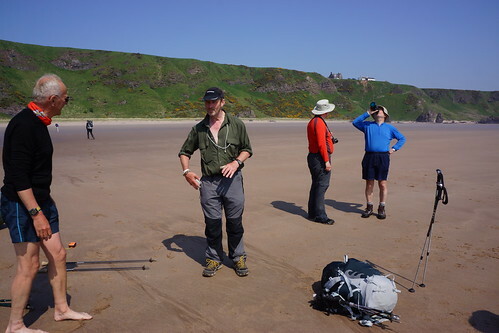 David, Tanya, Stefan Laetzel (from Germany) and I left Edzell in the early evening to head on for North Water Bridge. It wasn’t a whole lot farther to go, but there would be walking on some roads. 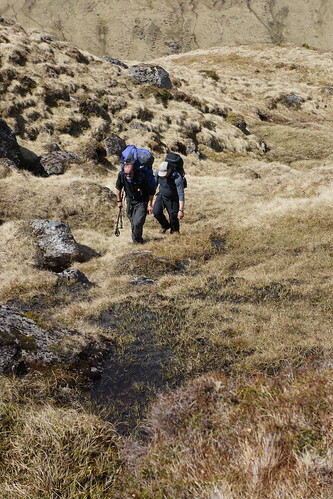 We did take as much of the “scenic route” as we could – Stefan was essentially guiding us, as he had done it before (last year, I think). My blister did hurt a bit, again worse while on the road, but I did OK with it. Another beautiful morning, on the final day! Hill of Morphie - the last one! 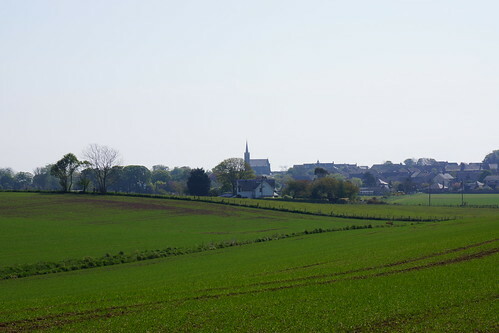 The church at St. Cyrus - not far now! Still a cliff that needs to be climbed! 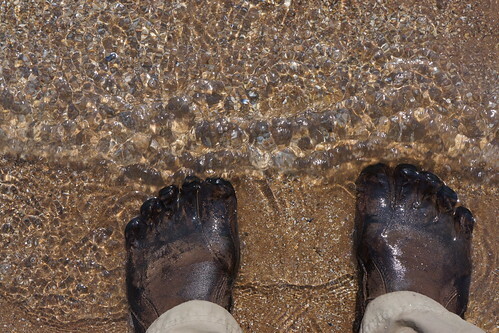 FiveFingers all the way - toes in the North Sea! Nearly time to leave - last chance to chat! This is Sunday May 20th. 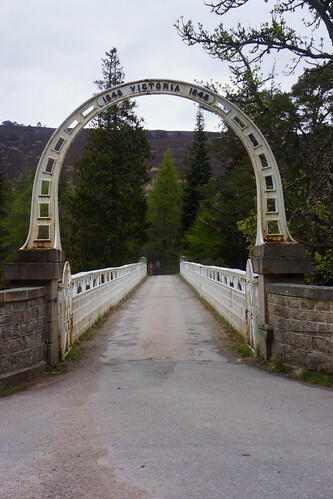 I’m in Braemar. 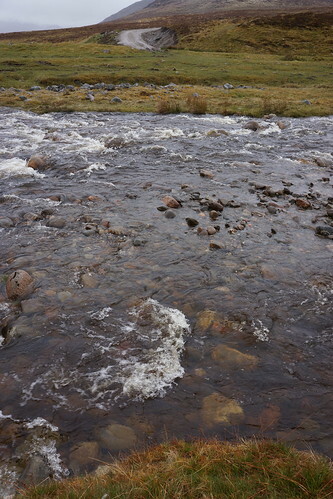 I got here yesterday at about 6 PM, after a long day of hiking from the Ruigh-aiteachain bothy in Glen Feshie. Met and re-acquainted with a number of folks, including Gordon Green and Alan Sloman and a number of others. 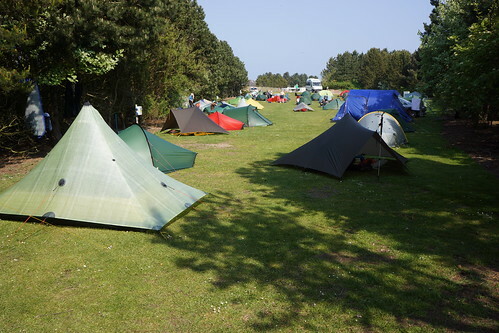 Didn’t see Andy Howell last night, but did this morning as he was camped just across the lawn at the caravan park (“campground” for the US folks). Went to church this morning at Braemar Church. I got there late, but was glad that I went. The sermon was on “use it or lose it” – referring to the gospel. Not a bad thought. After church I had “soup and pudding” at a benefit for the local primary school. Now I’m at the Fife Arms with some other Challengers having a beer. 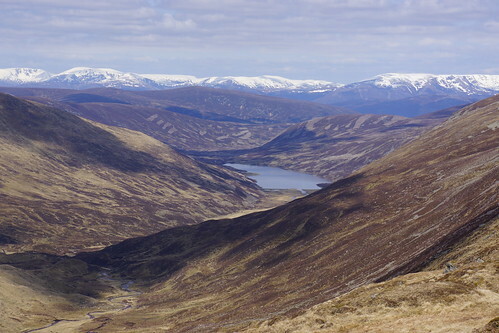 Probably will leave for Loch Callater soon. Still lots to update for the other days. That may need to wait a bit. 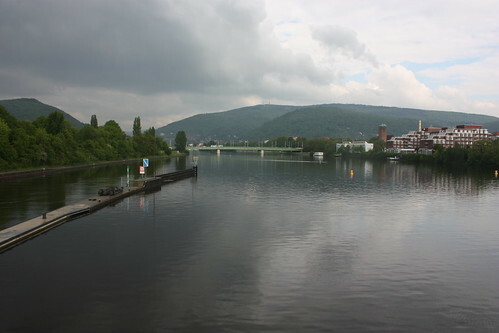 But things are going pretty well, and the weather is improving as of today. Still wearing the Vibram Fivefingers. I’ll try to add more and post more frequently for the rest of the trip. Additional notes (7 June): OK. I will go ahead and catch things up now (considerably after the fact, of course). The wind and rain were mostly gone in the morning. It was fairly cool, but overall not bad at all. Even a couple of my paper map sheets that had gotten rather damp and soggy the day before were now dry. And speaking of soggy maps, this was a good reminder that plain paper and inkjet printer ink is far from the ideal combination to be using for maps for a trip like this. I was well aware of that, and originally was thinking of printing my map sheets on waterproof “adventure paper”, but I hadn’t done that because I was running short on time and just using regular paper and the most accessible printer (an inkjet) was the easiest way to go. It should have been good enough, I thought, and it probably is good enough, actually, if you take enough care to to make sure that the maps always stay dry – inkjet ink and water just is not a good combination (that’s likely true on any paper, even if “waterproof”). In this case, I had pulled a couple of the sheets out of the plastic ziplock bag that I was carrying them in and put them in the more immediately accessible pocket of my windshirt, which I was wearing carefully underneath my waterproof-breathable Cuben jacket – but in the gale weather, either from some outside precipitation still coming in or from the accumulation of inside perspiration, or both, they became far too damp and the ink began to run. So, again, this was a really good reminder – I kept all of the map sheets in the plastic bag for the remainder of the trip, and I definitely need to and will take more care in the future (both with the maps and also with the camera!). 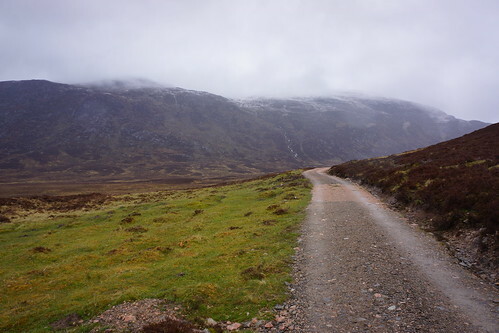 I took a look at the route possibilities and ended up deciding to essentially “bridge” my foul weather and original planned routes by walking down the track from Alltbeithe to Cougie, and then ultimately on toward Fort Augustus. 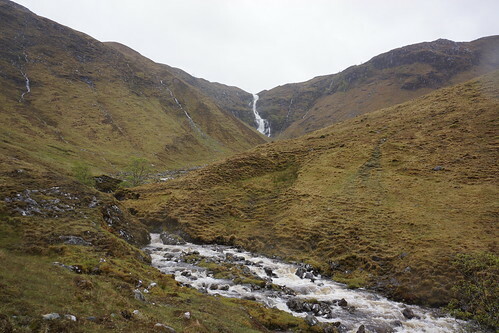 I did that for two reasons – one, the weather was looking a lot better and my original route, once I picked it up again, now should be doable, and two, this plan would also gave me the chance to walk for a while with David and Tanya. Even though it wasn’t exactly part of my planned route, it was on my (now dry) maps and this was familiar territory to me, since Lisa and I had walked this way in 2009 on our 3rd and 4th days to Cougie (where we ended our walk). 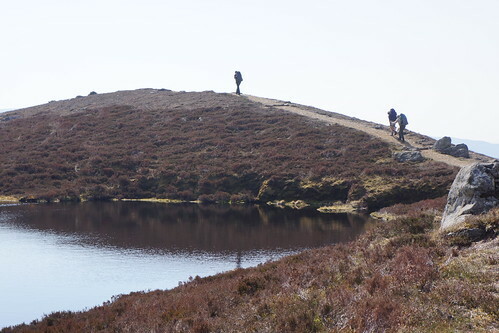 Even though that trip had ended up much shorter than we had planned, walking it again brought back good memories (even though most of the footpath was just as boggy, and maybe more so, than I remembered!). 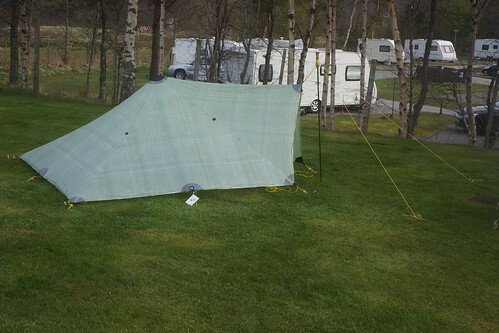 This was the only dry spot that Lisa and I had found to camp along the footpath in 2009 – it worked out pretty well, even though the slope was a bit of a challenge with our slick silnylon tent floor. The three of us went on the rest of the way to Cougie, and had a very nice visit with the owner, Val. She is a remarkable lady. Lisa and I met her and two of her daughters in 2009. At that time we had talked about their recent travels and adventure through the southwestern US, including southern Utah and Arizona. We talked a bit about that again, as well as the journey that she has gone through since that time, dealing with some very difficult and rather unusual health issues – but she has done amazingly well (which wasn’t really expected by her doctors initially), and she is going strong and looks great! After Cougie, David, Tanya and I continued on down the road. We took a brief detour to the top of Plodda Falls, a quite lovely spot (unfortunately, you don’t actually see the falls in the photo). 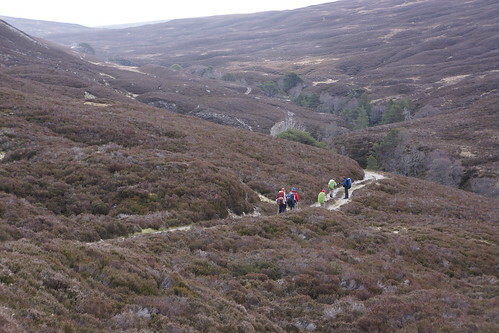 We then continued on a short while longer to near Hilton Lodge. 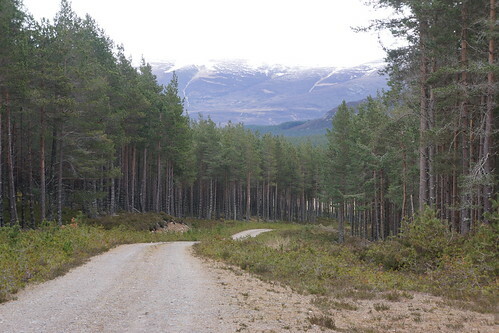 From there we took the track southeast and shortly thereafter left the forest. 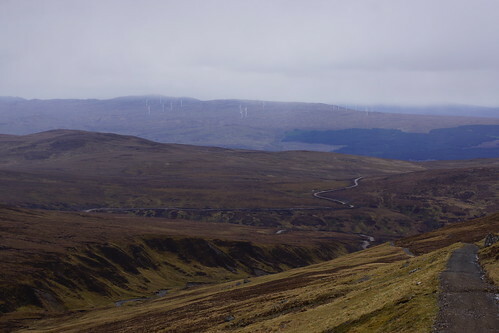 When we came to the power lines (pylons) it was time for David and Tanya to head northeast toward the Balmacaan Forest and Drumnadrochit and for me to continue southeast toward Torgyle Bridge and Fort Augustus. That’s one of the real joys of the Challenge – you (most often unexpectedly) meet up with and spend time for a while with very delightful people, and then you separate to continue on your own way and you spend more delightful time on your own. 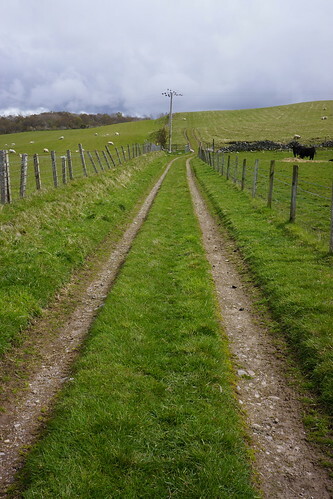 In my case I followed the power lines and the rather prominent gravel road (not just a track) toward Torgyle Bridge. I was making a tradeoff. 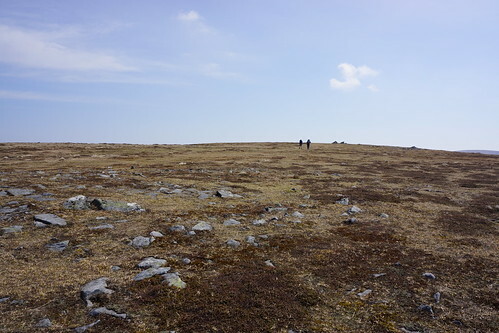 I could have gone straight over the fairly low tops from Cougie and then meet up with the road and power lines, which is what I had planned, or I could walk a little longer with David and Tanya and then follow the road and the lines all the way to Torgyle. 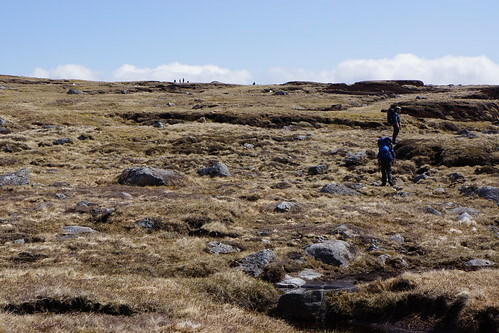 Generally road walking isn’t especially desirable, but in this case what won out was the additional company plus the lack of having to slog through what would have undoubtedly been very boggy ground on the tops (especially with the heavy rains the day before). I made it to Torgyle Bridge at just about 10:00 PM. Though it was beginning to get dark, I could still see well enough, but it was definitely time to stop. The caravan park by the bridge was totally quiet, and I also didn’t see any tents, so I went across the road on the other side and found a spot where I could pitch my TrailStar unobtrusively. I don’t know if this was actually “sanctioned” or not, but it didn’t seem likely to be a problem, and it wasn’t. The night was damp, but not rainy or windy, and not especially cold at that spot. I slept well. 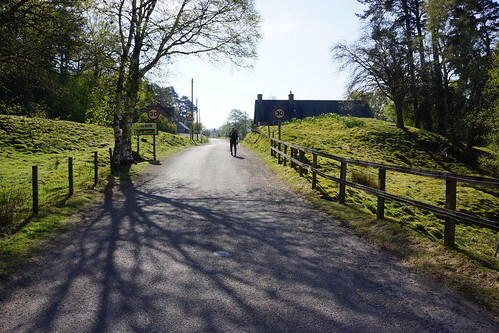 I got up fairly early and headed on toward Fort Augustus. 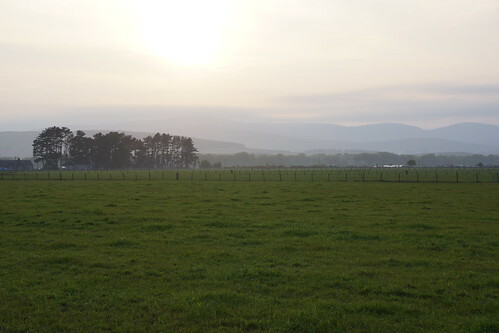 I wanted to arrive as early as reasonably possible, as I was behind schedule and I had other plans and arrangements already made at Newtonmore for Tuesday night, and I was still thinking about how I should deal with that. 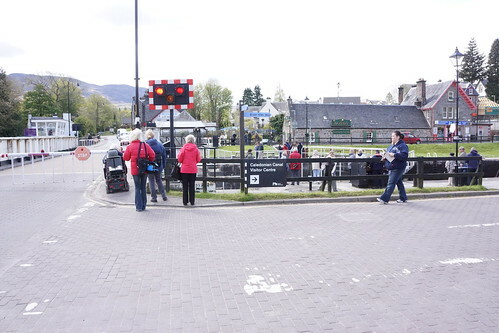 The first step was to get to Fort Augustus. Rather than taking the inital jog westward on the track, I elected to follow the power lines directly on up over the hill. 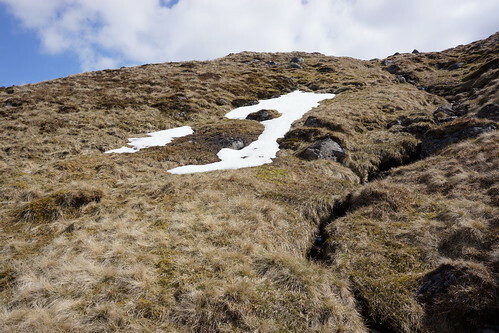 The climb was fairly steep, and I expected it to be boggy – which it certainly was. It might have been better in some respects to take the slightly longer path on the track, but it probably didn’t make too much difference, really. Later someone (I don’t recall exactly who) mentioned to me that they had gone the same way and saw the rather distinctive tracks from my Vibram FiveFingers – they definitely knew that I was the one that they were following! By that time several folks were already aware of my unorthodox footwear choice. 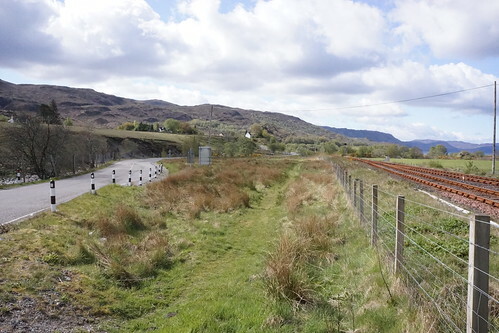 Once over the top it was time to rejoin the track and then shortly thereafter finally leave the power lines behind and follow the track toward Jenkins Park and Fort Augustus. 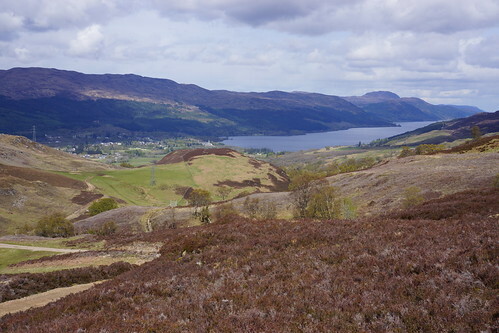 I did take one brief detour when I went down the larger track which took me in the wrong direction back toward the power line, but with only a little backtracking I got back on the smaller path toward Jenkins Park and then ultimately arrived in Fort Augustus shortly before noon. The question then was what to do next. 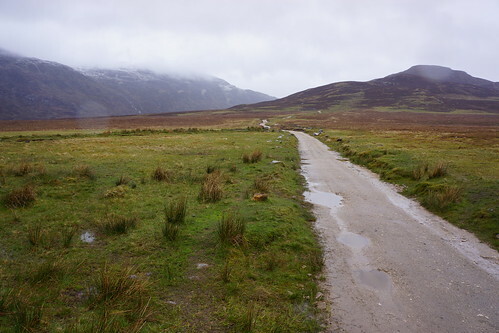 I had a spot booked for the night at the Newtonmore hostel, but there was no way that I could get there by walking at that point. My plan all along had been to mix some business with pleasure on Tuesday night, by calling in to the Terminfo sessions that were happening at the HL7 meeting in Vancouver, beginning at 1900 (1100 Vancouver time). 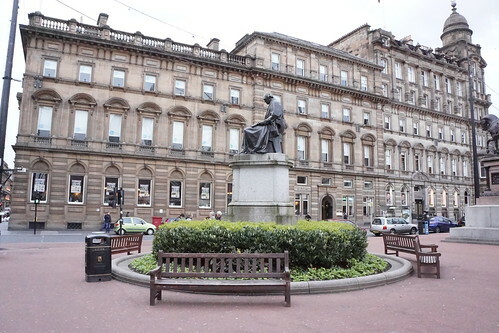 I felt that this was something that I should do, since I am currently a (or the) main leader of the Terminfo project, and I had to choose to miss the Vancouver meetings in order to do the Scotland walk. I had also worked out the arrangements for remote phone-in access for these sessions (for myself and a few others), so at the very least I should try the best that I could to make it work. 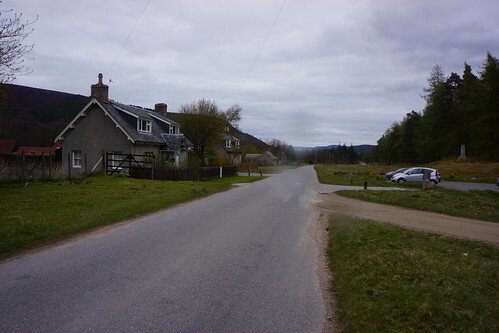 My MacBook Air was waiting for my arrival in Newtonmore, as well. 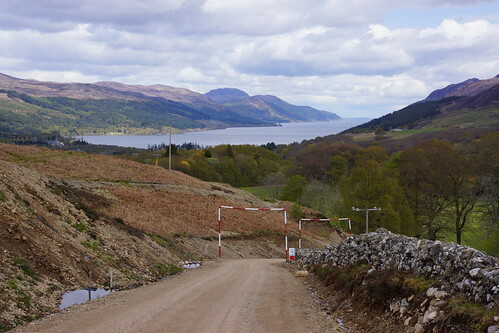 I talked with John Manning at Challenge control to let them know that I was officially in Fort Augustus, and to see if they might have any suggestions about the best way to get from there to Newtonmore. Taking the bus and changing at Inverness turned out to be the best option, so that’s what I did. That actually worked out pretty well. 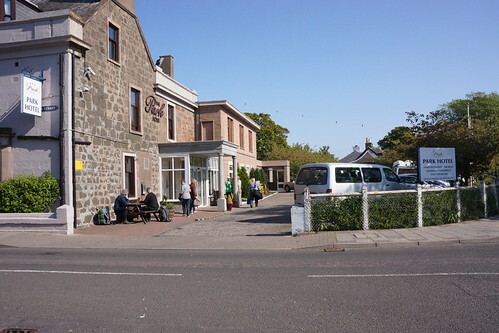 The bus trip wasn’t too expensive, really, and I got to Newtonmore in the mid afternoon and checked in to the hostel. I first spoke with Neil Oxley, and then later with Ali Ogden. They were very understanding and helpful, and to make my calls to Vancouver they gave me a spot in the main house (not the hostel building), which is where they live, and which had a much better wireless internet connection. I grabbed some fish and chips from a local place providing takeaway and sat down in a chair to make my calls, beginning at 1900 and ending finally at 2300 (with a break in-between). Somehow, it all actually worked! Several of us were able to call in from various locations and participate. My connection was good, and I was able to not only participate in but also to lead a good part of the discussions with the others on the line and in the room in Vancouver. Rather successful! At the same time that was happening I was also drying out my wet gear, including my camera, which I left in the drying room overnight. I finally went to bed, and again slept well (which is almost always the case for me). 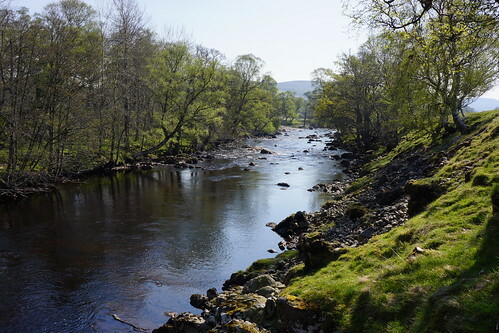 Day 6 (Wednesday, 16 May): Fort Augustus to Garva Bridge – and Newtonmore again! Now that my most immediate work-related concerns were over, it was time to get back on the trail and continue the walk. I packed up early. Fortunately, after drying overnight, my camera was working properly again! 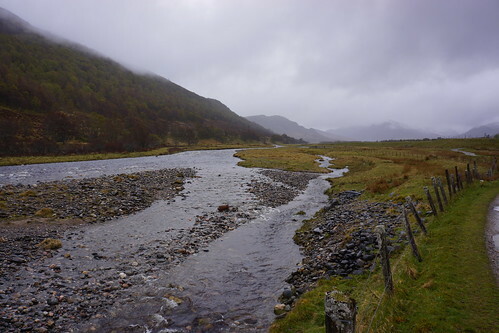 I took the earliest (about 0700) bus out of Newtonmore back to Inverness, then switched in Inverness to the Fort Augustus bus and arrived there at about 1030 (as I recall). 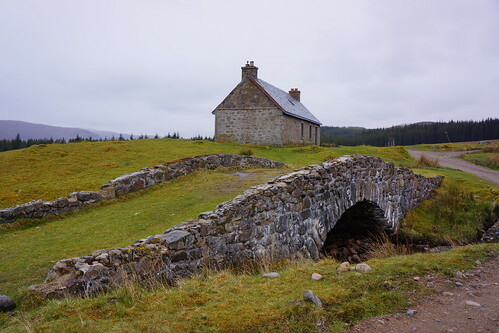 I still had some things to take care of in Fort Augustus before leaving, including picking up my package at the Post Office – I probably didn’t really need the food and most of the stuff at that point, but I needed to pick up the package, regardless. 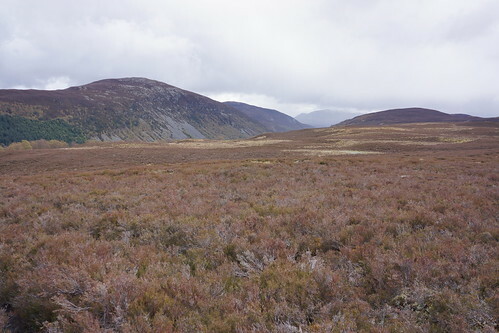 After sorting and re-packing, and having some lunch, I headed out of town toward the Corrieyairack Pass shortly after noon. 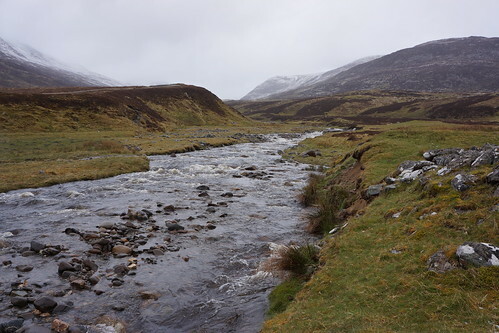 This was again on my foul weather route – this time not necessarily so much because of the weather, which, though quite cool, was much better, but more because I was behind schedule and I felt that I should try to make up some time. 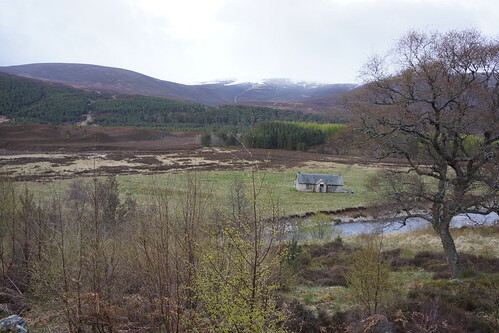 I was still planning to get to Braemar by Saturday night, if possible (my original plan had been to arrive on Friday, with a rest day on Saturday). The very first part of the path looked pretty much the same as it had in 2007. 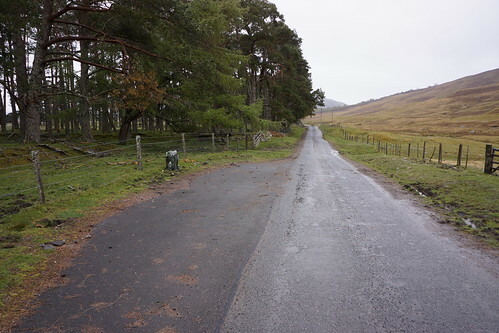 But quickly that changed – a lot of the smaller path had been replaced by a larger road for the power line development, looking very much like what I had been traveling on for a good part of the past couple of days. 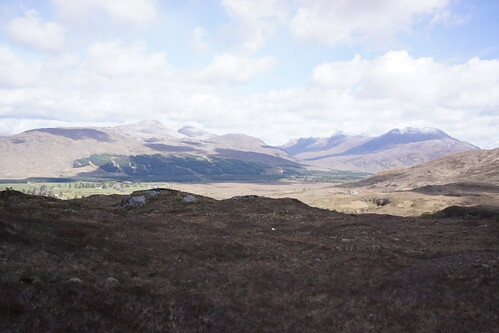 After Melgarve I kept going, but by the time I was getting near Garva Bridge it was clearly getting to be time to stop. At this point I wasn’t sure exactly what I wanted to do. The night before (Tuesday), Ali Ogden had offered for me to call and have her pick me up somewhere along the way back to Newtonmore, as I likely wouldn’t be able to get all the way there in one day (I hadn’t realized at the time that she thought that I was only going to be carrying a day pack from Fort Augustus, which actually hadn’t even occurred to me). It was looking like it was going to be a rather cold, drizzly night, and it was starting also to get fairly late – past 2100. So I decided to take Ali up on her offer and gave her a call. I’m not quite sure why I did that, really. 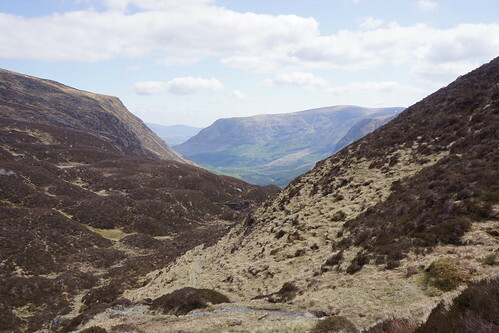 It felt a little like cheating, though it actually wasn’t – I was going to walk all the way, regardless, and I was even carrying all of my kit (gear). 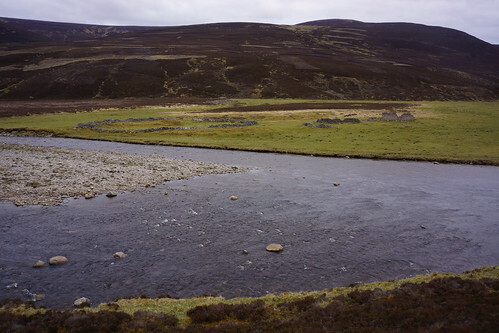 I certainly could have camped at Garva Bridge, but at that moment that hadn’t seemed for some reason to be an option that was too appealing. 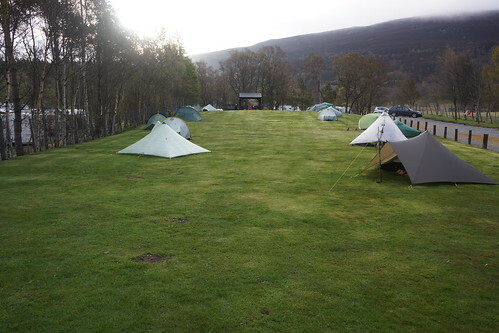 So Ali picked me up on the road just past Garva Bridge, and I spent a second night inside the Newtonmore hostel. It was still a great place, but maybe not quite as logical a choice as the night before. Before going to bed, this did give me one final shot to do a bit with my computer before I would finally get it back in Montrose in a few more days when the walk was finished (but I don’t think that having access to it again really helped much this time). 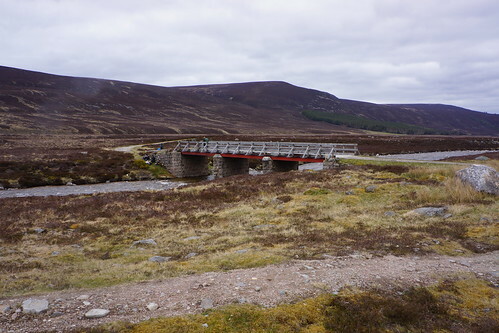 Day 7 (Thursday, 17 May): Garva Bridge to Newtonmore – the last time! 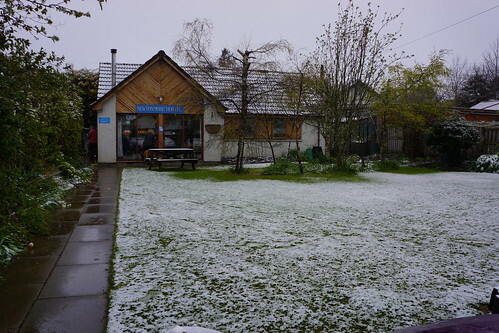 We woke up Thursday morning to snow – in Newtonmore itself! No one had really expected that – apparently not even the weather forecast from the night before. Ali was planning to give me a ride back to the spot near Garva Bridge where she had picked me up the night before. She was also going to be driving to Montrose on Saturday, as she headed back home to England, and since she would already be going there she offered to transport my computer and anything else that I didn’t want to carry so that I wouldn’t have to post it. That would be very helpful! So I packed the MacBook and several other items back in the post box and passed them on to Ali. Before leaving I thought it would be nice to have a more substantial breakfast, so I made a quick trip to The Glen Hotel nearby. Breakfast seemed to hit the spot, and probably gave me a bit of extra energy. 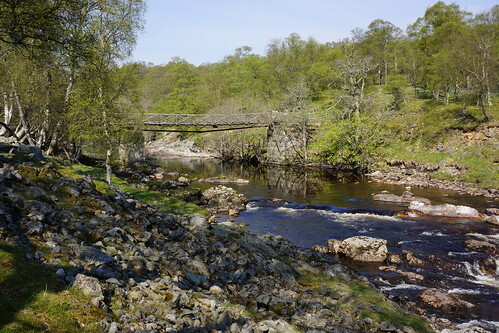 After that, we headed back out to Garva Bridge. Ali is a GP (similar to a family physician in the US), and traveling with her from and back to Garva Bridge at least gave us an opportunity to talk about the state and future of the US and UK healthcare systems. 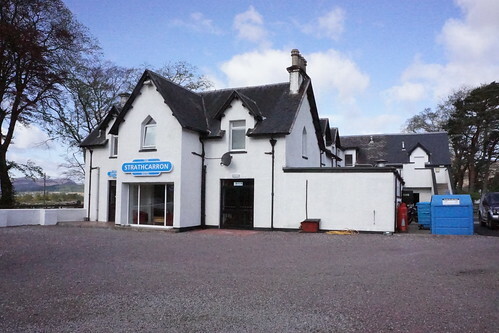 As she and her husband are now part owners of the Newtonmore hostel, along with Neil and Sue, eventually she will likely be moving to Scotland, and then probably will do locum practice somewhere in the Newtonmore area. But for now she is still working in her usual surgery (i.e., medical practice) in England. 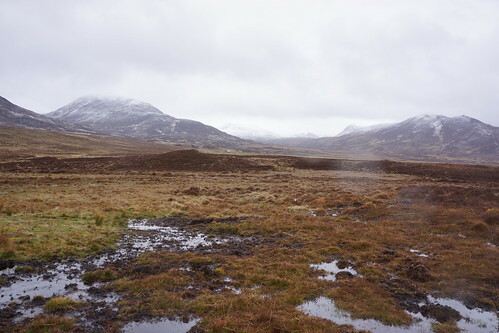 There had been snow during the night at Garva Bridge, as well as at Newtonmore. 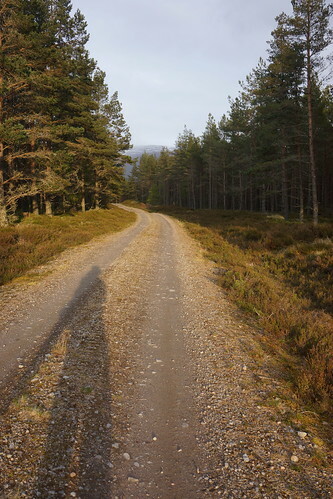 But even though I was back on the trail (or road, actually) at a reasonably early hour, by the time we arrived there whatever snow there was had already melted. 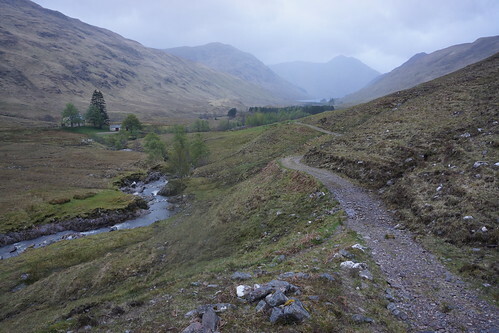 The walk on the road from Garva Bridge to Laggan took a bit of a toll – as walks on paved roads often seem to do. That’s where I developed my only blister of the entire trip – just under the base of my third toe on the right foot. Shortly after I first noticed the “hot spot” I stopped and drained it (while it was still small, I was thinking), and it did feel better afterward and I didn’t think about it too much as I continued walking. But, unfortunately, even after draining the blister did continue to bother me over the next few days and actually for the rest of the walk. It wasn’t really terrible – many Challengers wearing conventional footwear did much worse, but still it was quite bothersome and annoying at times, and sometimes slowed me down a bit. This blister wasn’t nearly as bad as what I had with my feet in 2007, while wearing the Chaco sandals – but, disappointingly, it did mar my “perfect” record just a bit. 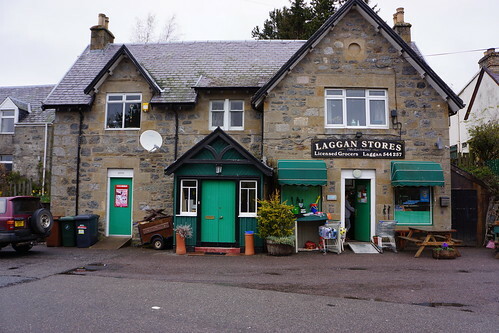 Laggan Stores was a nice stop, as before – although there weren’t any other Challengers there this time. Even though it was still quite cool (there had been a “chill wind” every day so far), I bought and enjoyed a small cup of some really great tasting ice cream. 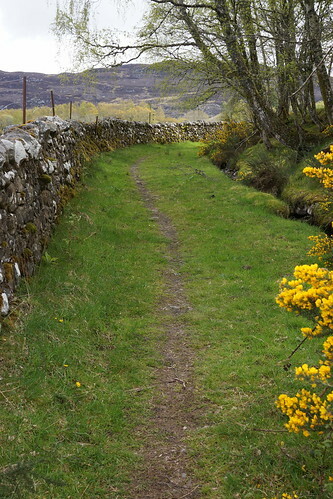 Just after Cluny Castle I turned off of the the road to take the public footpath to Newtonmore via Glen Banchor. That turned out to be much more impressive than I had anticipated – actually one of the highlights of the trip, I think. I had briefly considered going this way in 2007 (it had been suggested to me by another Challenger), but that time my feet were hurting enough that I felt that I couldn’t even seriously consider it – so I’m glad that this time I was able to do it. Wet? Muddy? Not a problem! I finally arrived back at Newtonmore. This was seeming to get a bit ridiculous – like I might continue to head back to Newtonmore forever (was this Groundhog Day?). However, this time I really was there officially, on foot, so maybe I wasn’t doomed to repeat this forever? I would actually be able to move on in the morning! 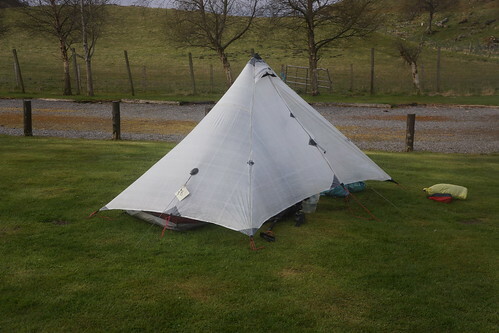 I didn’t want to sleep indoors for another night, so I pitched my TrailStar on the lawn (as one of the others had done the night before). 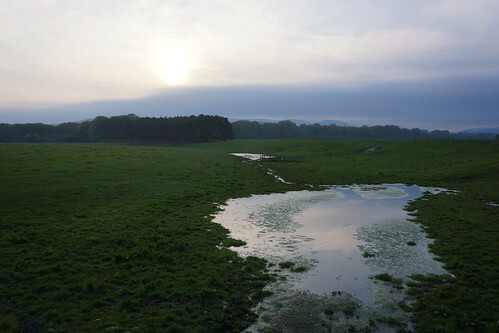 It didn’t rain much, or snow, during the night this time – again, I slept well. 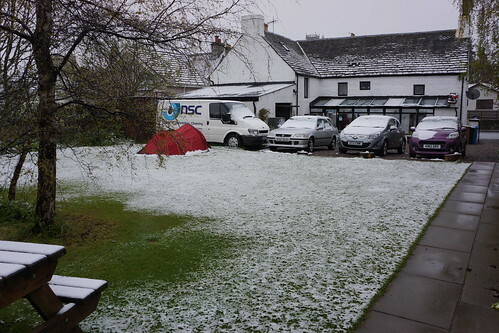 There was no snow on the ground this morning in Newtonmore. Up until this point I had been carrying a backup pair of shoes along with me, a pair of New Balance trail runners. 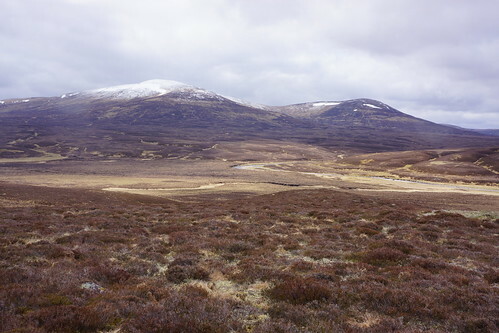 So far I had put them on only once – briefly on Tuesday night, when I first arrived in Newtonmore. I wore them when I walked down the street to get my fish and chips. 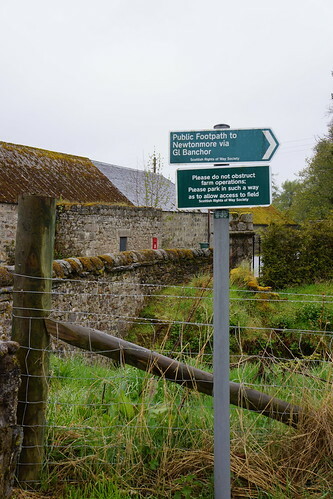 That wasn’t part of the official walk, of course, as I was actually supposed to be in Fort Augustus, so it wasn’t cheating. 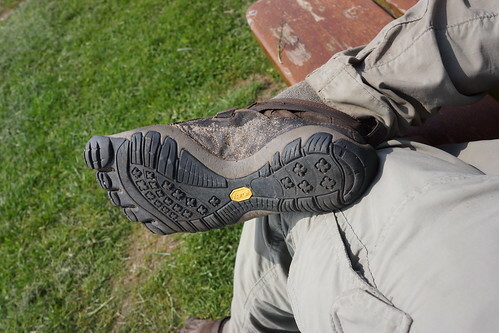 Even having them on briefly, though, I didn’t actually like the way that they felt on my feet – compared to the FiveFingers they felt constricting, and I really didn’t want to keep wearing them. But, even with the blister that had developed only the day before, by this time I was convinced that I would be wearing the FiveFingers the entire way to the east coast. So, before I left the hostel I checked with Ali to make sure that she was still going to Montrose tomorrow (Saturday) as planned, and then I passed my New Balance’s on her to take to Montrose along with everything else. No more carrying the extra weight, and no more backup for my feet – I was now totally committed! Ali had also suggested that I just might want to head to Aviemore today and then catch the train back to Newtonmore and spend another night at the hostel, since so far over the last three days I had arrived in Newtonmore by bus, by car, and then on foot, but not yet by train – that was the final possibility! Tempting as it was (not! ), I politely declined. 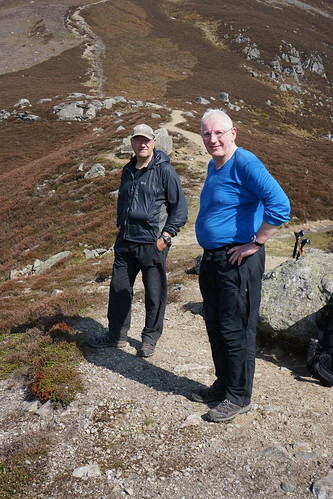 Instead, I headed out and walked to Kingussie with Freddy Campbell and Giles Cooper. A few other Challengers were nearby and heading in the same direction, as well. 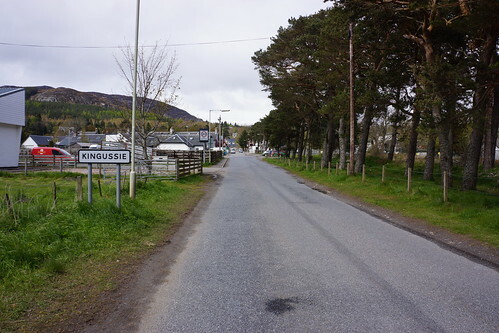 In Kingussie I needed to get some cash and do a bit of shopping for food and “meths” (“methylated spirits”, or alcohol) fuel for the stove, so I left Freddy and Giles at that point and they went on ahead. 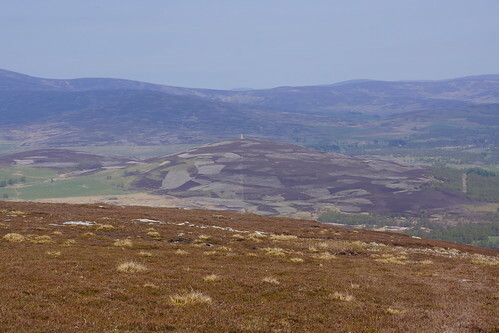 I also decided to have lunch before moving on, so I ended up leaving Kingussie later than anticipated, but my goal was still to get to Ruigh-aiteachain on Friday. This route again was my foul weather alternative. 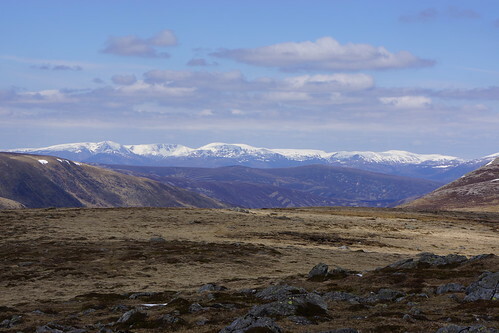 This time I needed to go with the FWA because my main planned route would have been over the high tops in the Cairngorms, and would have been often in probably waist deep snow. I wasn’t even considering attempting that. 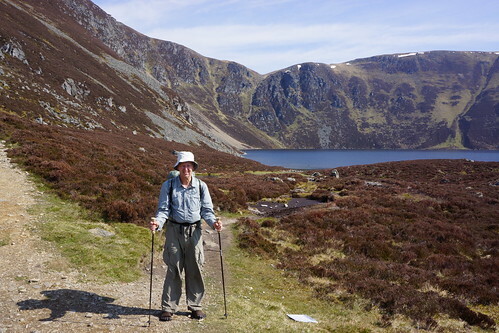 I did consider, however, changing my route to cross instead through the Lairig Ghru, as I had done in 2007. 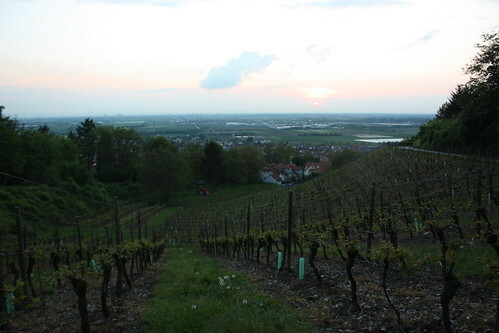 In 2007 there wasn’t snow, as there would be now (but instead there had been heavy rain and high winds). I was pretty sure the Lairig Ghru would be passable (which was later proven to be correct by David and Tanya, and others), but in the end I decided not to attempt it and to stick with the originally planned FWA through Glen Feshie – mostly I did that because that’s what I had told both Lisa and Challenge Control I was going to do (plus it also might have taken a little longer). I decided to play it safe. 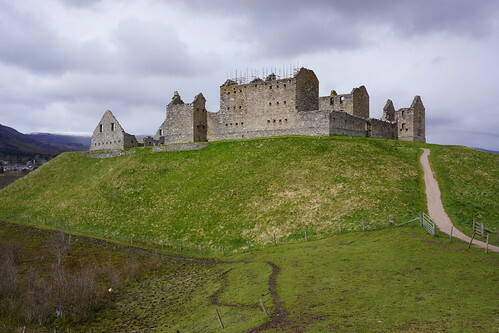 I had to stop and take some photos at Ruthven Barracks – it’s a fairly impressive structure, with a good bit of history. 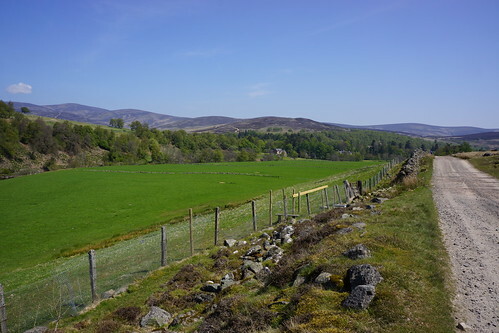 From Ruthven I headed southeast on the track toward Gentromie Lodge and ultimately to Glen Feshie. 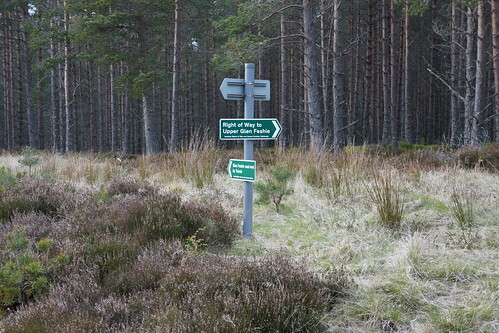 Once I entered the Inshriach Forest, the navigation appeared pretty straightforward – just take the east track and turn right at the junction. But it didn’t quite work out that way. I apparently got on a slightly different track that was not actually on my map, that left the first section of the forest at a different spot than I was expecting. 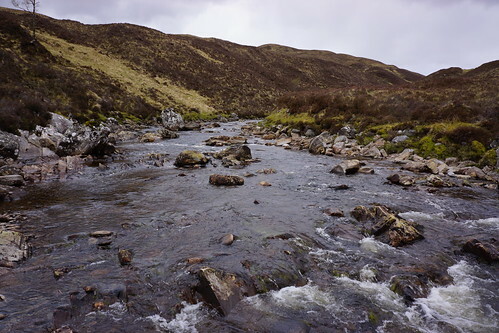 I crossed the small burn (stream) and followed the path across the open area toward the second forest section – things looked right, almost. But it didn’t take all that long to determine that the path that I was on disappeared and that I wasn’t going to find it again this way – I was indeed in the wrong place. 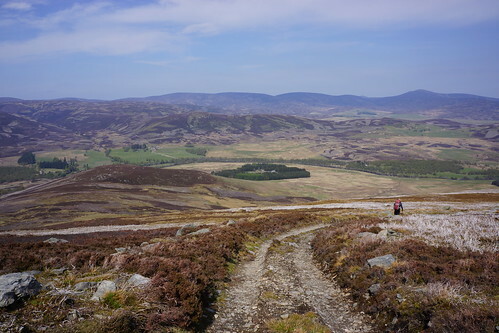 So I did some backtracking, and then followed a different track through the first forest section to get a bit farther north, until I reached another junction and turned onto a good path that was going the right direction – east southeast. 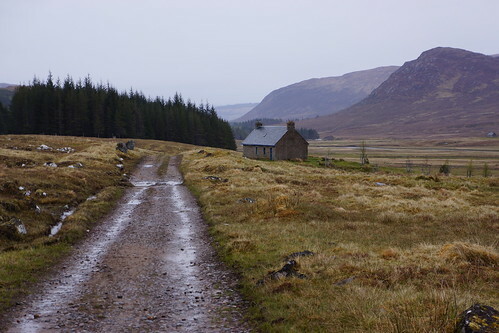 At this point I had lost some time, although probably not too much, but I still wanted to get to the bothy so I really didn’t want to lose any more. 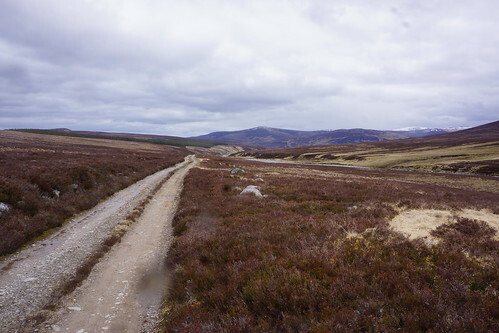 This track and the surroundings really did look correct to me, heading in the correct compass direction and consistent with the map, but I thought that it would be best to be sure. I fired up the GPS and the maps on my phone for the first, and only, time on the trip – the signal was good enough for the maps to be useable (I hadn’t had time to get the map tiles all pre-loaded), and it turned out that I was indeed exactly where I thought I was! That was quite comforting. 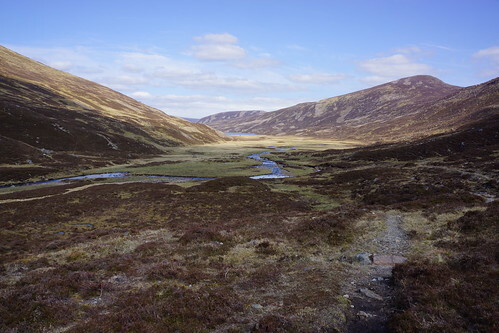 So I turned off the phone (and therefore also the GPS) and then headed on forward down the track and out of the forest, across the burn and the open area, and then into the second forest section, now not far at all from Glen Feshie. The first sun (and shadow) in nearly a week! 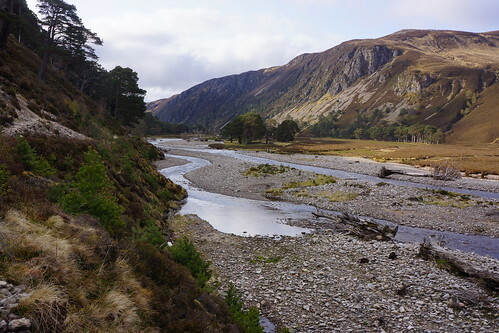 Once I got through the forest and into Glen Feshie I first decided to walk on the road on the west side of the river. 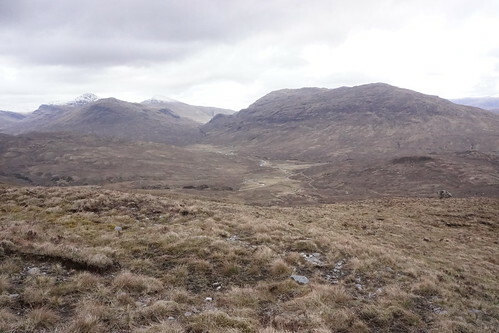 The bothy was on the east side, but it didn’t appear that there was much of a track over there (as far as I could see). 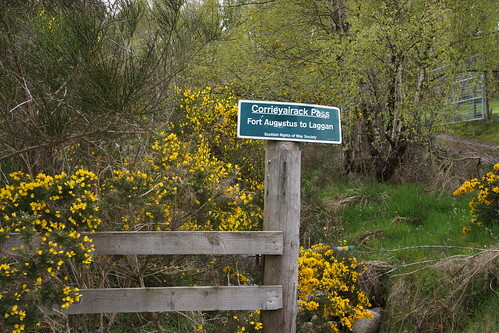 Fairly soon I walked past a rather non-official-looking sign saying something about “the last bridge across the River Feshie” (or something like that) – I didn’t really know whether I should take it seriously or not, and I didn’t! 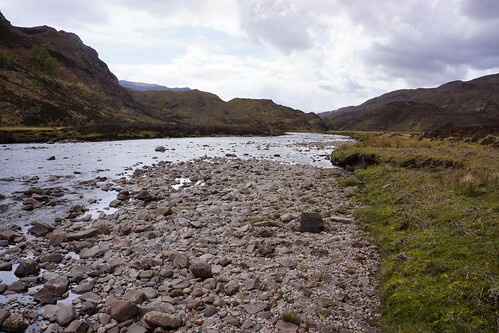 A while later I realized that since I really was going to have to cross the river, it was likely that I was going to have to do it without a bridge – so I found a reasonable spot and then went ahead and forded the river – it wasn’t too bad, really. 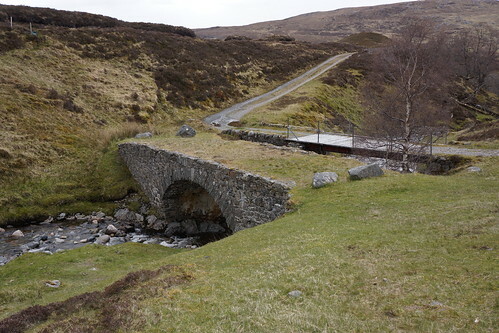 Not very long after I was across, I did discover that the sign indeed had been correct – the bridge that was shown on my map at Carnachuin had been washed out a few years before. But it was no matter at that point. 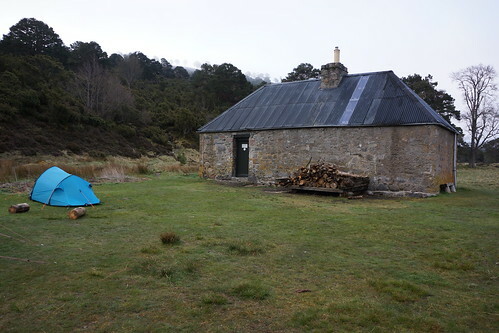 Not long thereafter I arrived at Ruigh-aiteachain bothy. 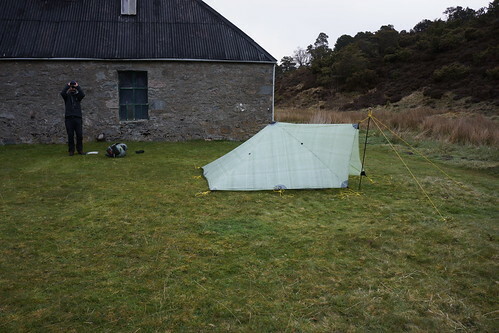 I set up the TrailStar and camped outside the bothy, along with a few others. I cooked and ate my meal, got some water and took care of a few chores, got inside my hooded pullover and sleeping quilt and went to sleep. 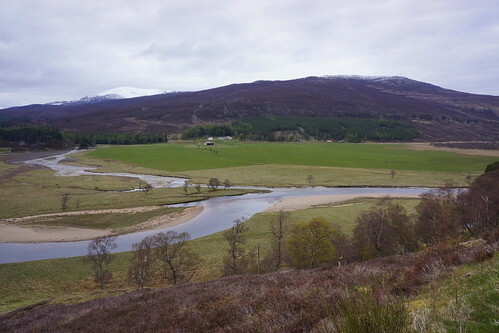 My goal today was to get to Braemar. That wasn’t necessarily going to be easy – it would be a long day, but seemed definitely doable. 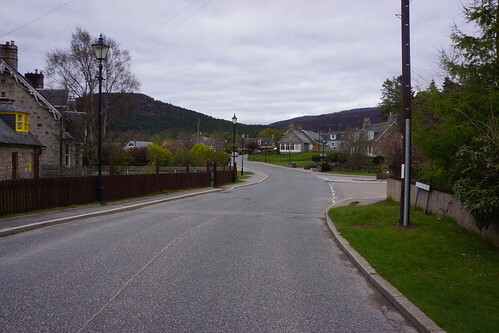 I ended up making it to Braemar at a reasonable time. I headed on to the caravan park, checked in, picked up my package and went to set up camp. The next thing to do was get some food. Rather than cooking my own, I decided to go into town to get some and thought I would give the “new” Hungry Highlander a chance. I even ordered the fish and chips, although that clearly is no longer their specialty. I gather that the Indian food that they are serving tends to be rather good – Willem Fox and Leendert Bakker ordered theirs shortly before me, and enjoyed it. But the orders are definitely not speedy – the wait even for the takeaway seems to be quite long. My fish and chips actually weren’t bad, although there was a mishap with them at first. They guy who prepared them asked if I wanted salt and vinegar, which I did – but while shaking the salt he somehow popped the lid off and dumped the contents of the entire salt container (a large one) right on what would have been my fish! So there was even more delay for me – but they did try to make it right and they prepared a new order as quickly as they could, so I really can’t complain. After the fish and chips, I wandered up to the Fife Arms – I saw John Smith, and some others, and then went on to the Moorfield House Hotel for the Saturday night gathering. I had a beer (or two? ), saw Gordon Green and Alan Sloman and some others, but still didn’t see Andy Howell. 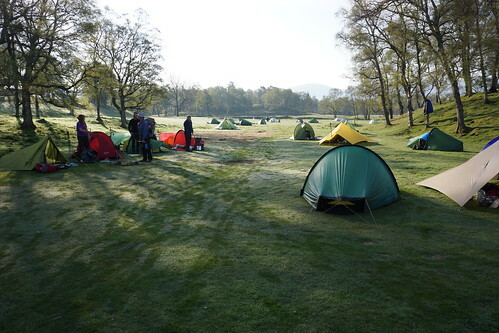 The gathering seemed a little less active than I had remembered from 2009, but the temperature outside was also much cooler than it had been then, particularly in the unheated tent. The tent also didn’t have many chairs inside, so it wasn’t that conducive to sitting around and hanging out. 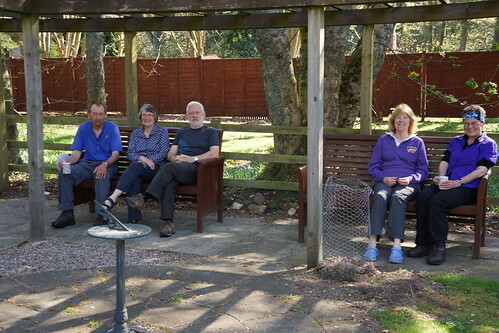 I went back inside (for most of the time) and stayed at the Moorfield for a little while longer and enjoyed some conversations, but then it was time to head back to the caravan park and to bed. Sunday morning was looking pretty good – we had started to have some sun, and it definitely was a bit warmer. I still hadn’t seen Andy Howell yet, but here is his Duomid. Andy and I had a chance to chat for a bit before he headed out. I decided that I would try to go to church – although, with the service beginning at 0945, by the time I got all the various chores done (including washing out my socks) and had everything packed up, I was a bit late getting there (see the comments above). 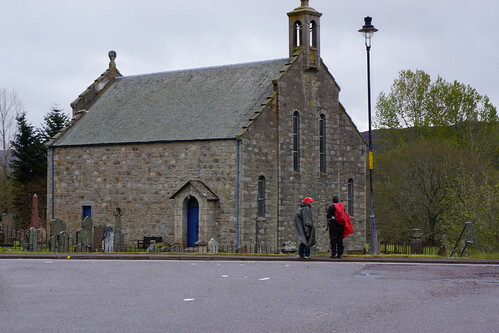 But after the service I again met the lady who had first welcomed me into Braemar as I was walking into town the day before, while she was also out for her evening walk at the park. She was interested in the Challenge and had chatted with me then, and was very warm and welcoming both then and again on Sunday morning. 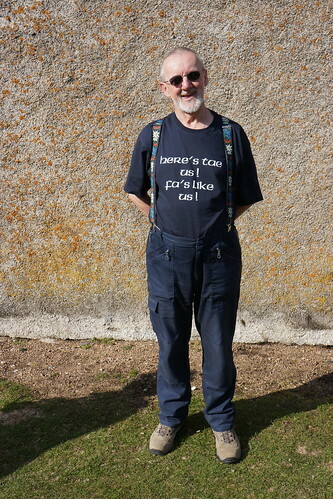 I also met the sister, Pat, of one of the other Challengers, Doug Bruce, who lives in Braemar. I talked briefly with the visiting minister, Reverend John Andrew (their usual minister was preaching at the opening of a new building in Romania that Sunday). He had some awareness and interest in Utah and the aspects of ministry in our local culture, so we had a nice chat about that. They were all aware of and interested in the Challenge and those of us who were taking part in it. I was also informed of and directed to the “soup and pudding” benefit to support the local primary school (“pudding” basically seems to mean dessert). That turned out to be quite nice, both for the food and for the friendly service and conversations from both the kids and adults. I think it’s always nice to meet and get to know local people and be able to participate in their activities, when possible. After the “soup and pudding”, I headed back to the Fife Arms for some beer and further conversation with the group of Challengers congregated there. 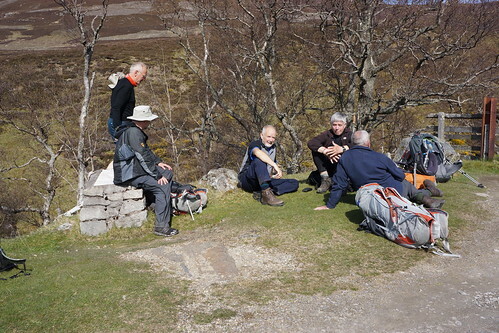 Most of them were planning to hang out there for a while in the early afternoon and then amble on to Lochcallater Lodge. 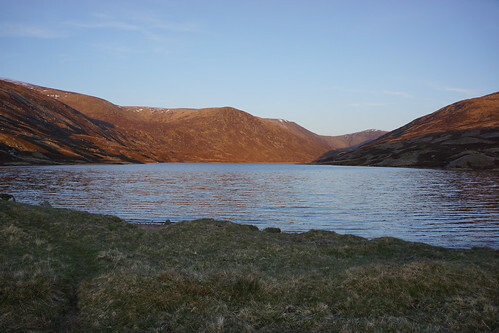 Finally, after a not too prolonged stint at the Fife, Freddy Campbell and I headed out toward Loch Callater. We met up with most of the others along the way. 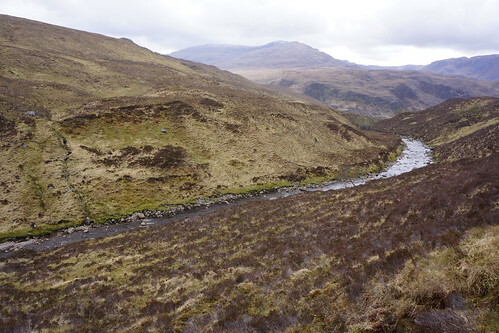 Originally I had been planning to just pass through Loch Callater and go on over Jock’s Road and then into Glen Doll. But I didn’t start nearly early enough for that, nor did I feel like doing anything especially ambitious that day. I hadn’t gotten my full planned rest day, but this was sort of a partial one. 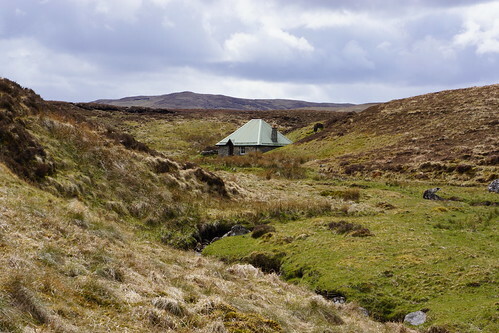 It made much more sense to stay at Loch Callater for the night – plus, I would really get to experience the legendary Lochcallater hospitality! 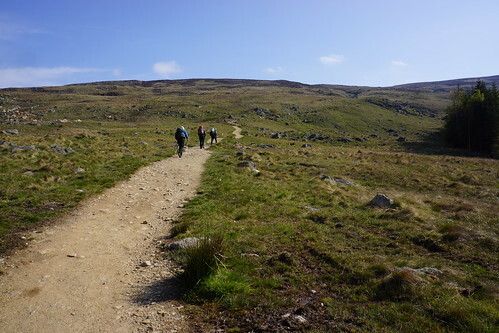 Other "pilgrims" on their way to the Loch Callater "shrine"
I must say, Lochcallater Lodge certainly didn’t disappoint! I didn’t really know entirely what to expect, but I had a reasonable idea. For the food in the afternoon and evening, my timing seemed a bit off and I ended up missing it, including the birthday cake (there were celebrations for Lynsey and Biagio’s (sp.?) birthdays)! But the hospitality and camaraderie were simply wonderful. That was aided by more than a wee bit of whisky, but I don’t think that’s the reason. People simply enjoyed sharing the time together. 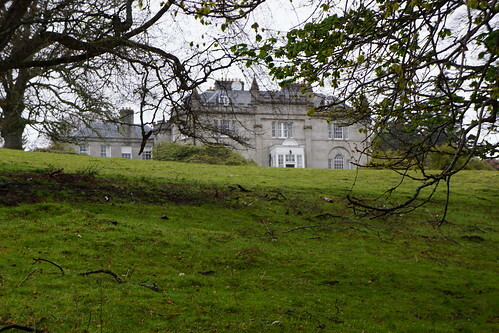 Bill Duncan and Ross Tennant (Stan’s son) were extremely hospitable and welcoming. I mingled a bit and checked out the groups and conversations going on in two or three different rooms. Bill offered a beer and I settled in for a while in what seemed like the “main” room. It wasn’t too long before the singing began (which again is legendary, I gather). So for the next while we sang various Scottish (and probably other) songs, and generally had a good time. At one point John Farrell played his whistle (Irish whistle, I believe it was) – very nice. The singing was ably led mostly by Croydon and JJ, with some help from Bill and a few others. The culmination seemed to be, at least for me, the whole group singing “I Am the Music Man” (video clip of Black Lace version). 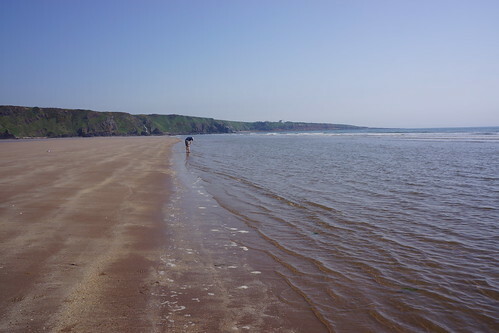 That song, in particular, kind of stuck with me – I found myself humming or singing bits of it as I was walking over the next few days. Once we had finished singing “I Am the Music Man”, I believe the time was somewhere between midnight and 0100, so I figured it was time to head out and get some sleep. 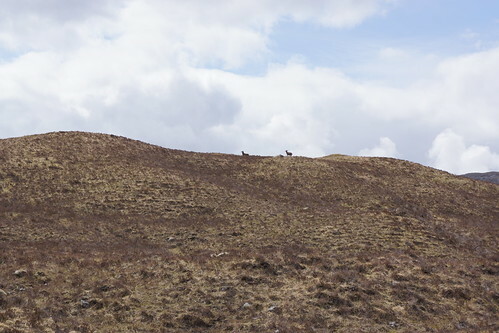 Some of the others seemed to still be going pretty strong, though, and I believe continued on for maybe another hour or two – but back comfortably in my TrailStar, at that point I no longer was noticing. So now I am finally all caught up – at least for this section! Today is the real start of my journey. I’m ready to head out in the hills. It’s a sunny morning in Scotland (for now) More to come! 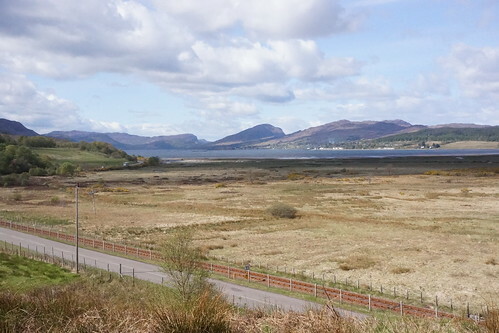 Leaving Strathcarron - the weather is good! It’s now actually Thursday May 16th (Day 7) as I write. Quite a lot to catch up on! This was a pretty good first day of actual walking. 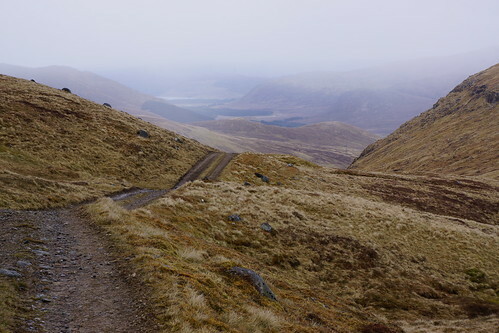 Progress was good, and the weather not bad overall – mostly mixed clouds and some occasional sunshine, with intermittent rain (pretty light), with a bit of sleet a couple of times for interest – typical Scotland! 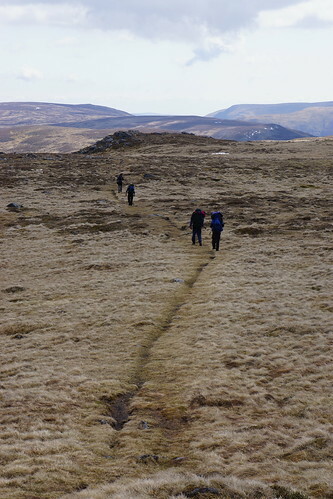 There were some rather boggy tops to cross. Navigation went well. 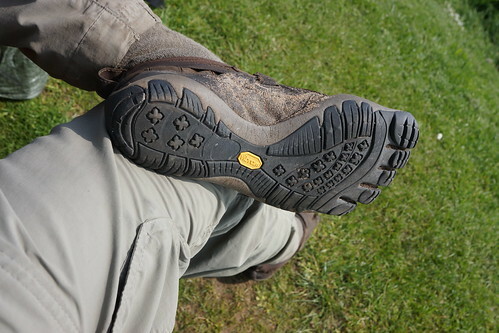 My feet seemed to be holding up well, and the Vibram FiveFingers were comfortable. Being wet didn’t matter, and that actually seemed to make them feel even more comfortable! I had no particular problems. 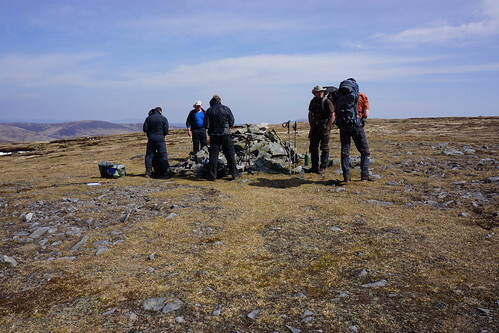 It was a fairly long day, though, and fairly demanding – probably more demanding than I had actually expected, but about what Alan Hardy (my route vetter) had described. By the time I reached Iron Lodge it was pretty late and it was definitely time to stop. I camped by myself in the grass nearby, and slept well. This was supposed to be the start of my walk, but it didn’t quite happen. Had to do more work before I left Inverness, and then I had to finally sever the lifeline and post my MacBook Air on to Newtonmore. 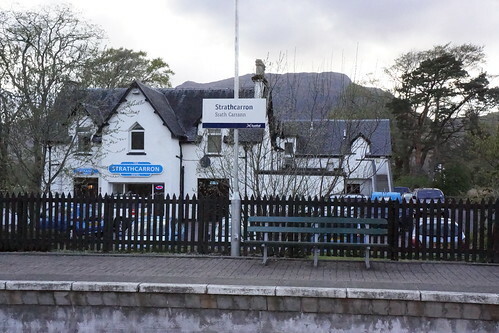 Made it to Strathcarron at about 8:00 PM, and finally decided to spend the night in the Strathcarron Hotel. Met fellow Challengers Alan Hardy (who is also my route vetter), along with Bernard and Rod. 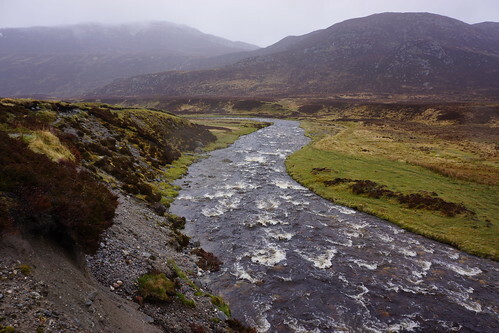 They had their first day coming from Torridon, in “interesting” weather, and decided to take a side excursion to enjoy some food and drink at the hotel. After we finished chatting, they went to their campsite nearby, and I to my room. 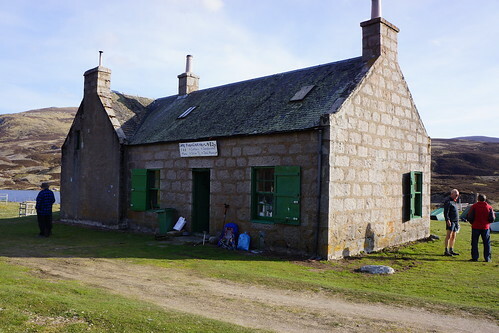 Was supposed to get to Strathcarron today, but didn’t make it because I needed to get some work done and I spent a lot of time at the Post Office. I had to post packages to Montrose as well as intermediate points. Took the train to Inverness, but could get no further that day. Stayed with Matthew and Janet Vogan, and their son Joseph. Mark had put me in contact with them – he knows Matthew through mutual Reformed church associations. A very gracious and wonderful family! Flew back to London and (almost) immediately took the train to Glasgow. Actually, I just barely missed the 8:30 AM train I was scheduled on, but got the next one. 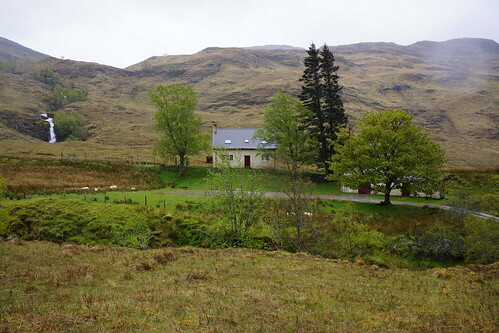 The youth hostel I stayed at was good.